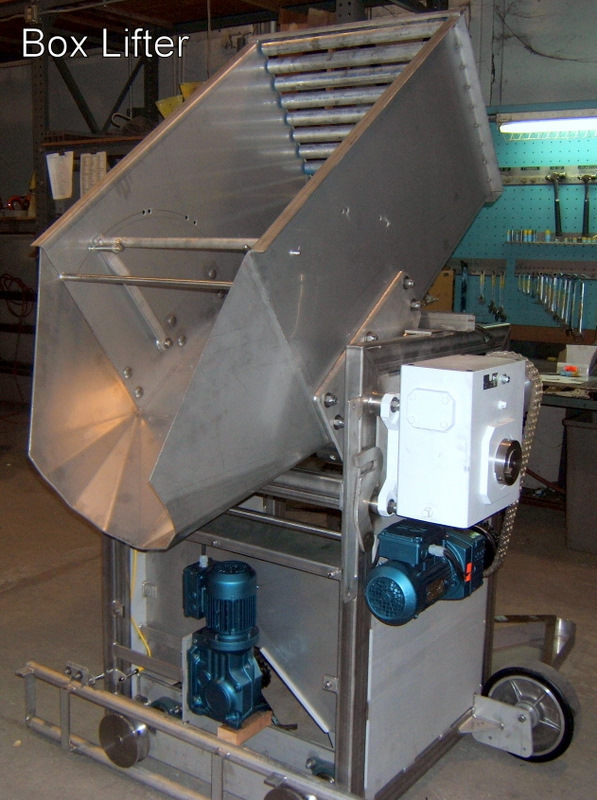 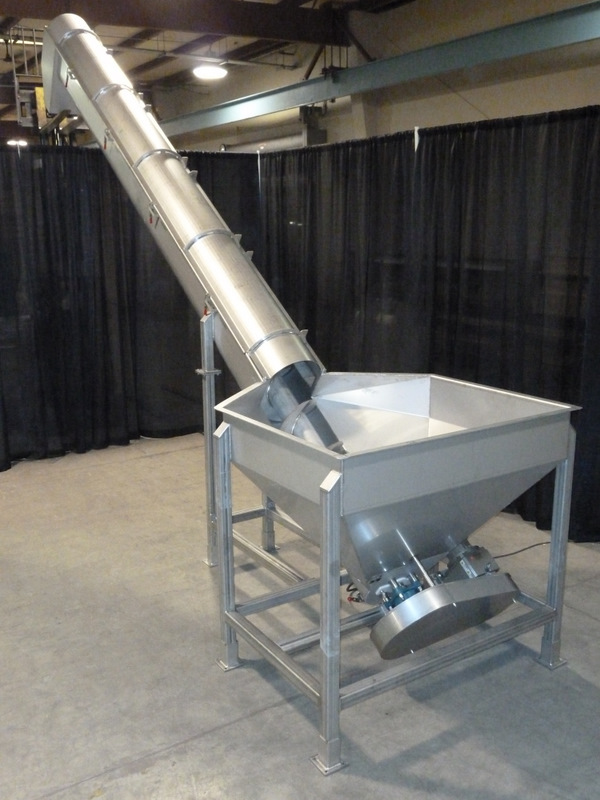 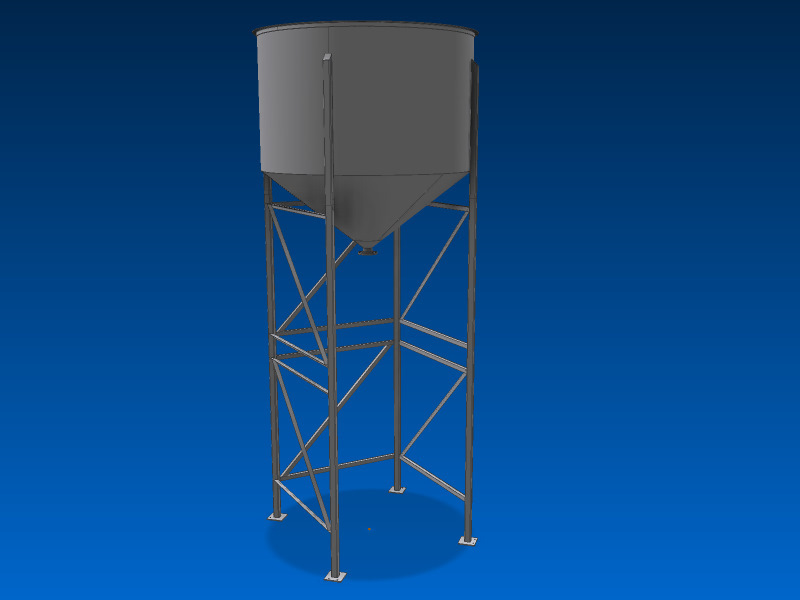 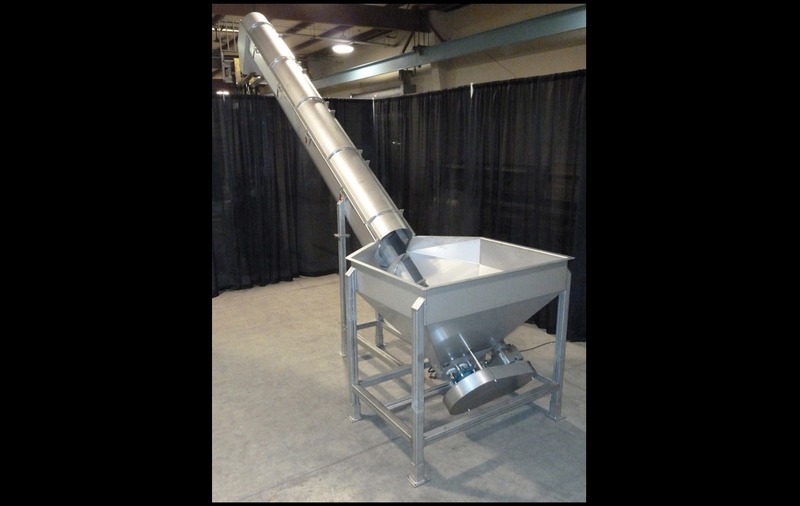 Millard custom builds Augers and Screw Conveyors supporting a wide variety of applications for moving and/or mixing products from one operation to another or into storage containers, transport hoppers, combos, vats, drums, etc. 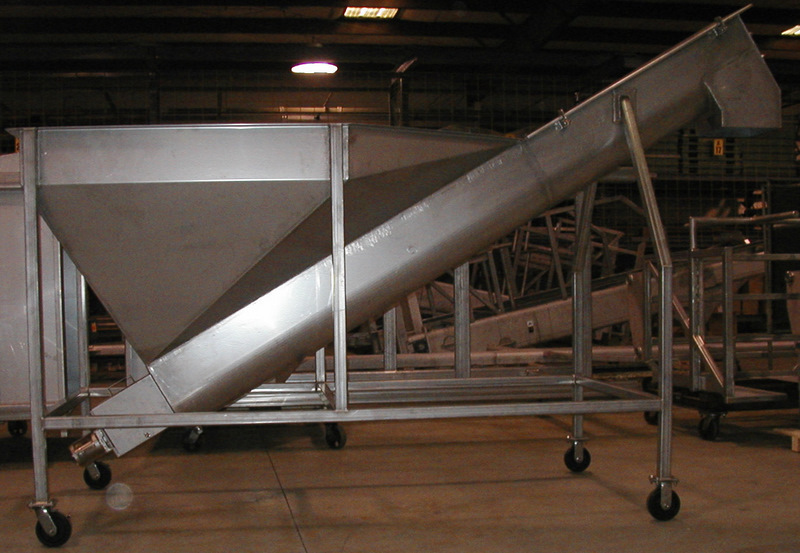 Our augers are made with heavy duty stainless steel following our "Safety and Sanitary Design Standards". 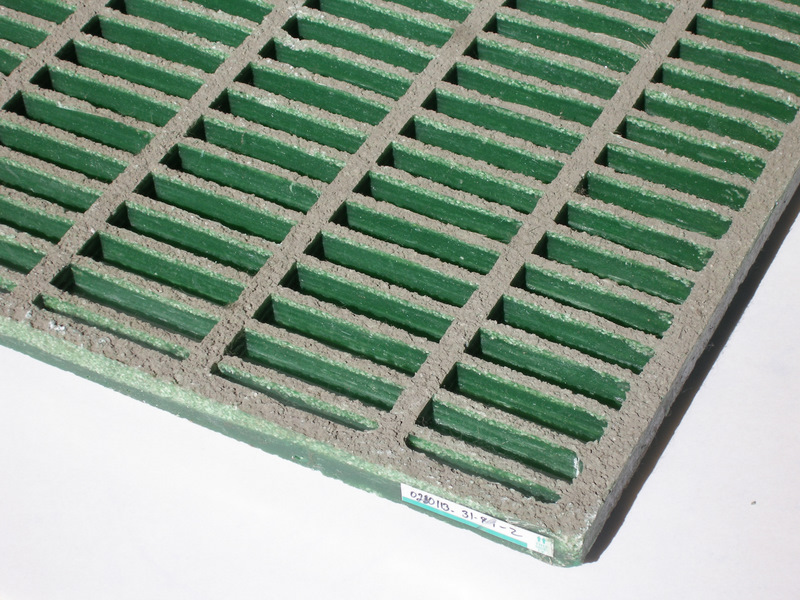 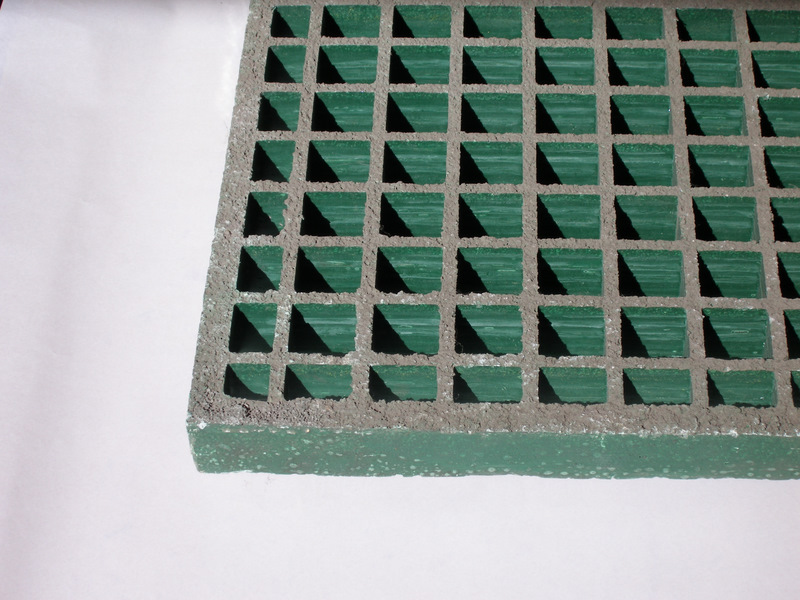 Carbon construction is available for less sanitary conditions and needs. 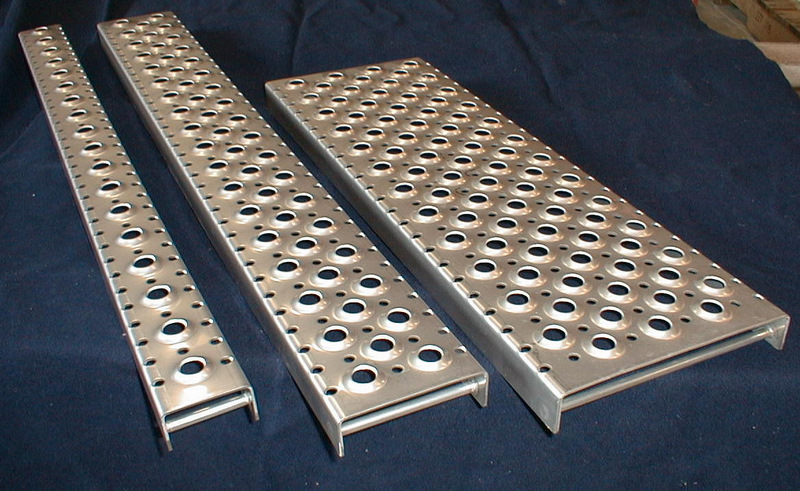 We offer a wide range of sizes (most common are 6", 9", 12" and 20"), and most custom sizes available. 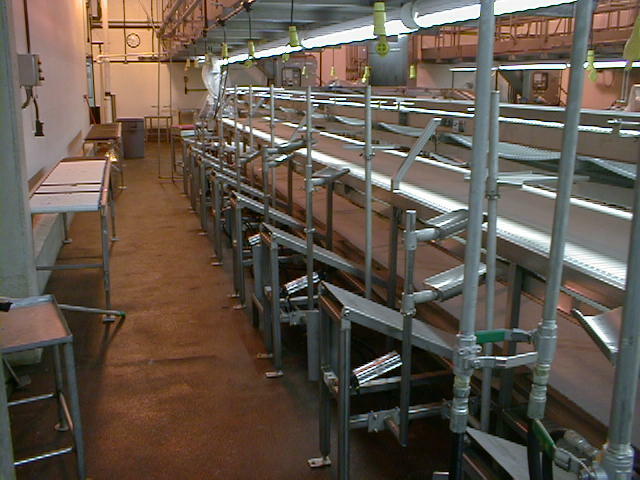 We offer a variety of Carts (also known as Product Trucks) for the food processing industry to move not only food products but also non-food items essential in operating your facility. 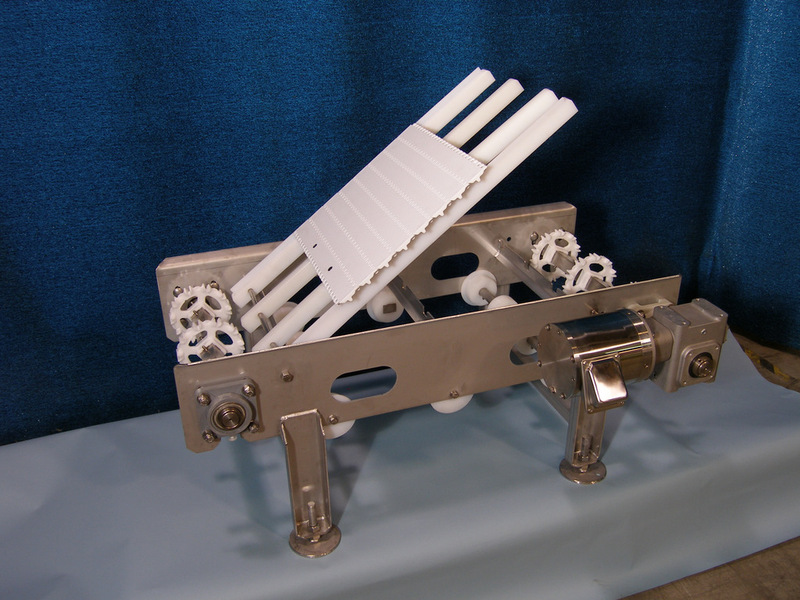 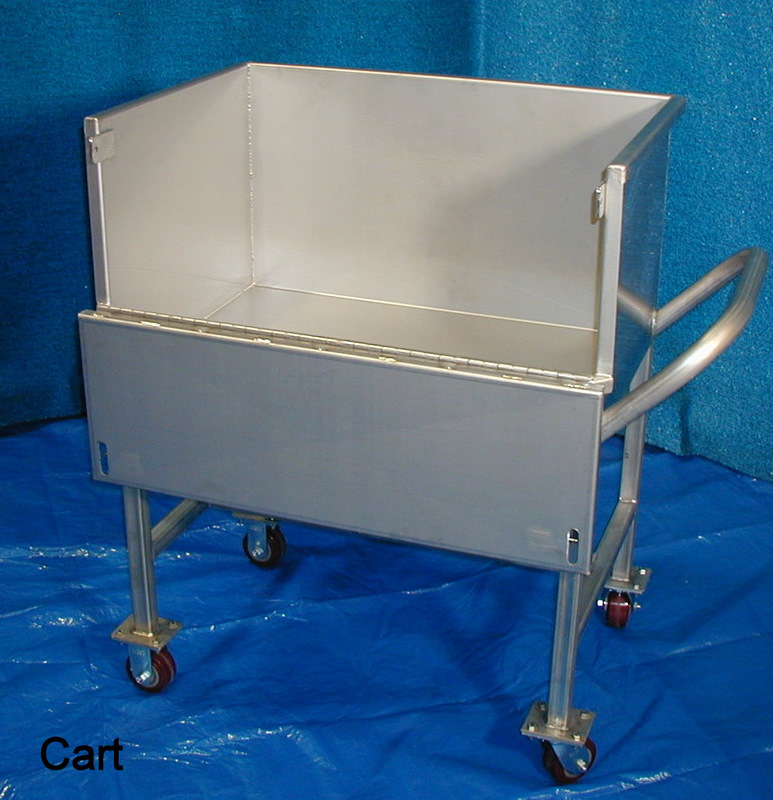 All our carts are made from heavy duty stainless steel and use the highest quality components and casters. 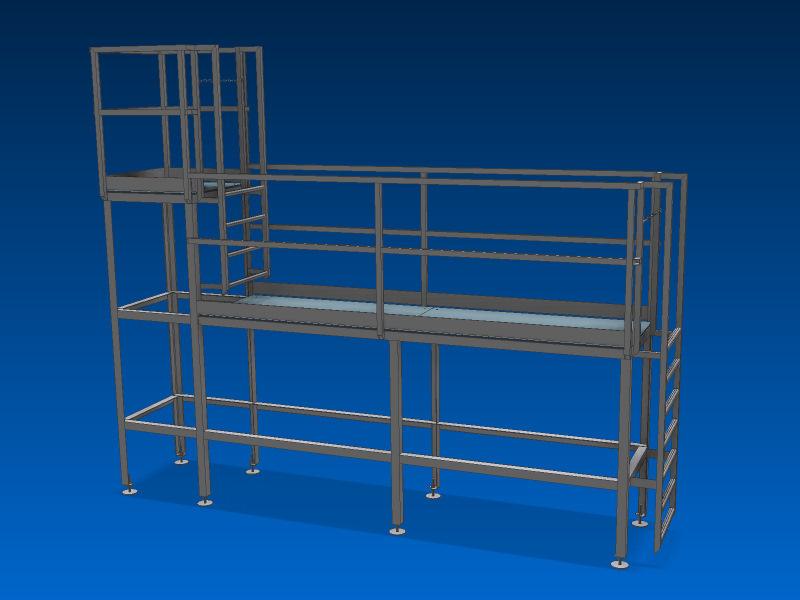 We can build to your designs or work with you to custom design a solution. 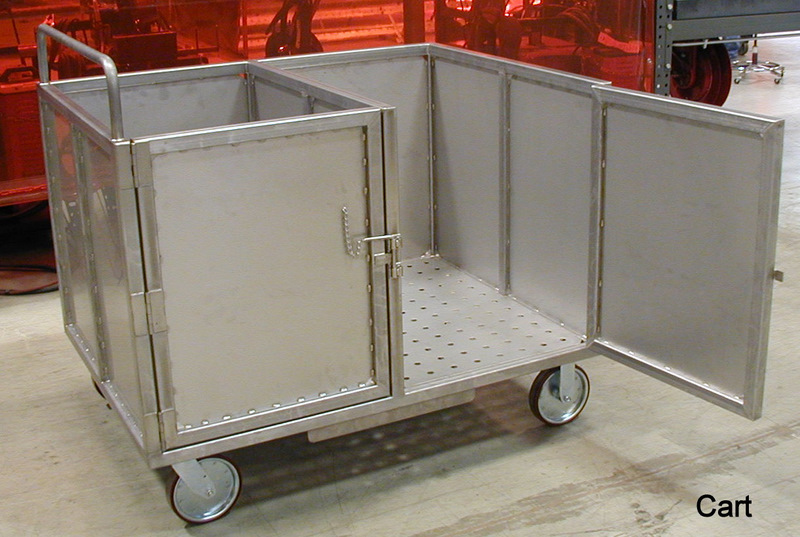 When a catalog cart will not quite fit, call us and we can get you what you need. 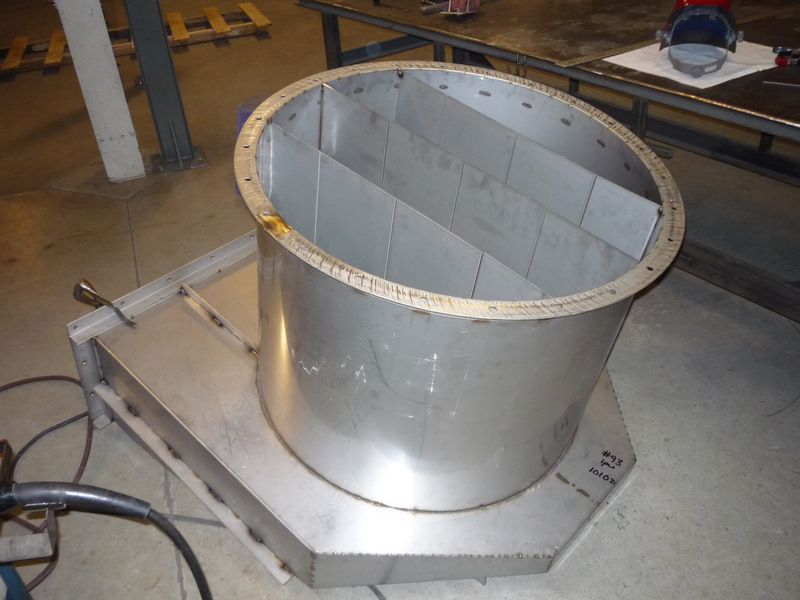 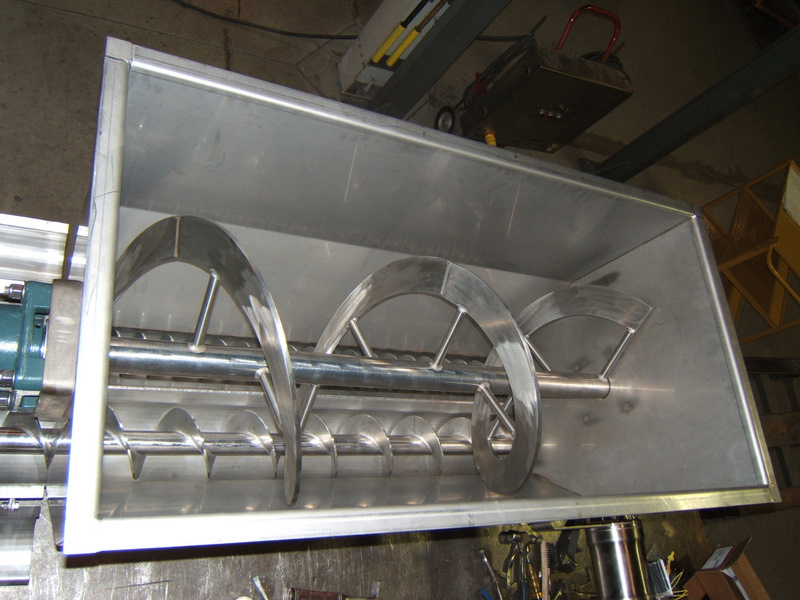 Millard can custom build most any Ductwork, scrubber ventilation, or venting hoods you need to fit your application. 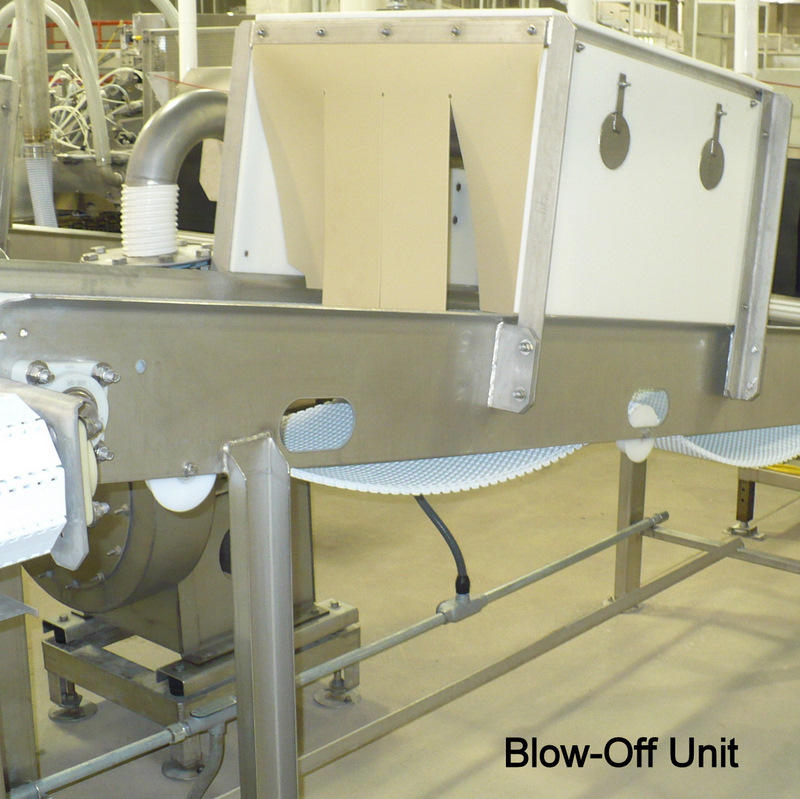 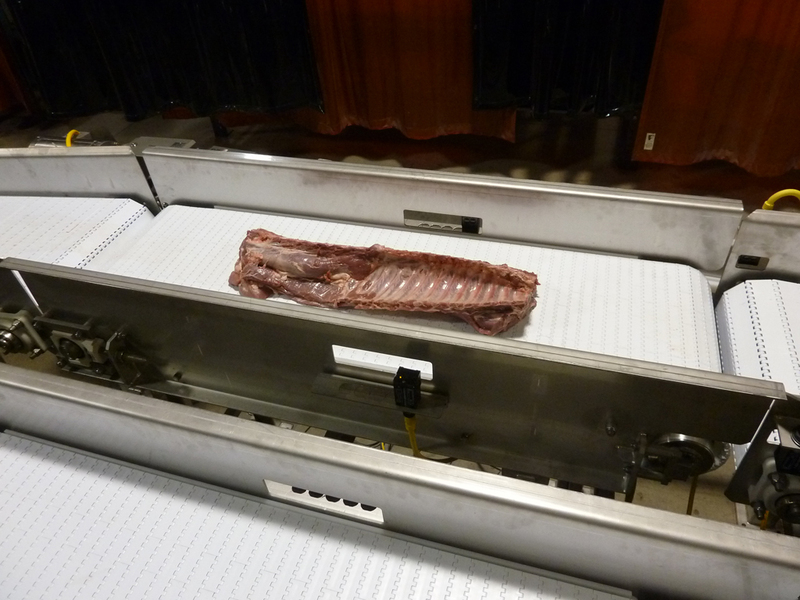 Applications vary from Heat removal, Exhaust, Ventilation, Cook Hoods, Steam Hoods, and more. 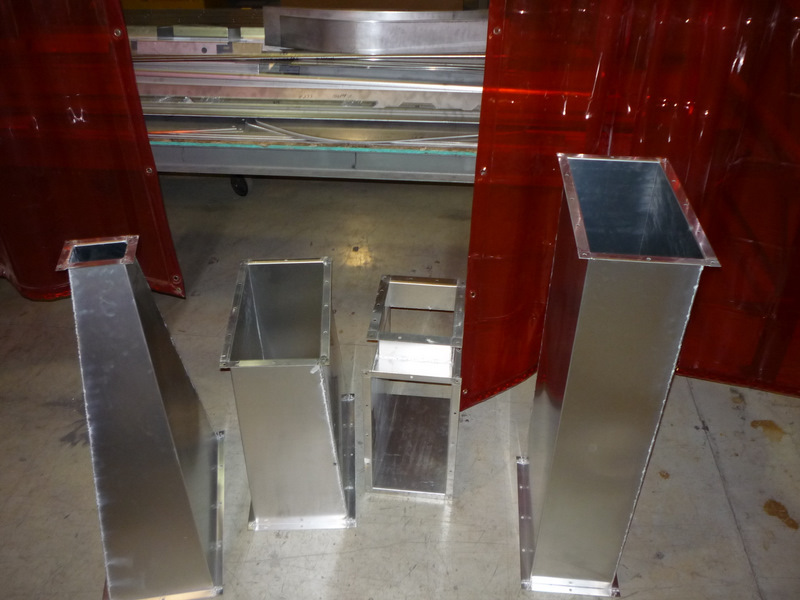 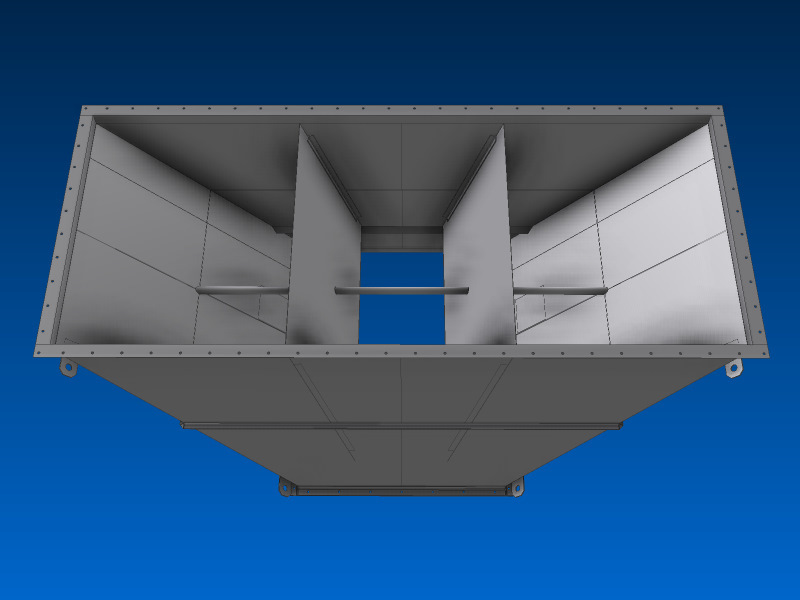 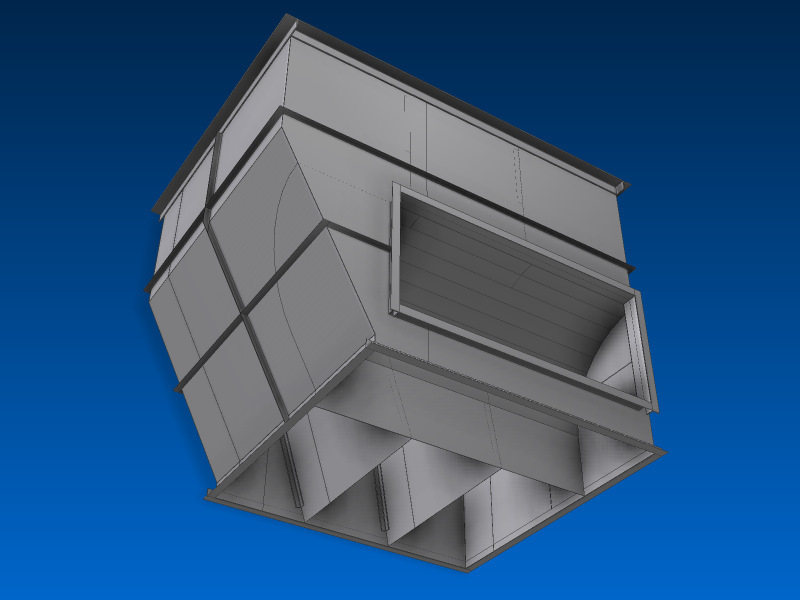 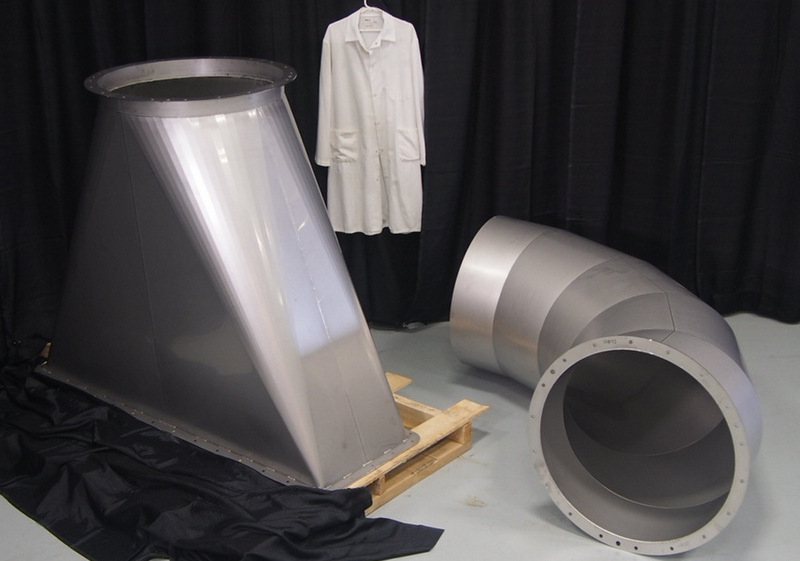 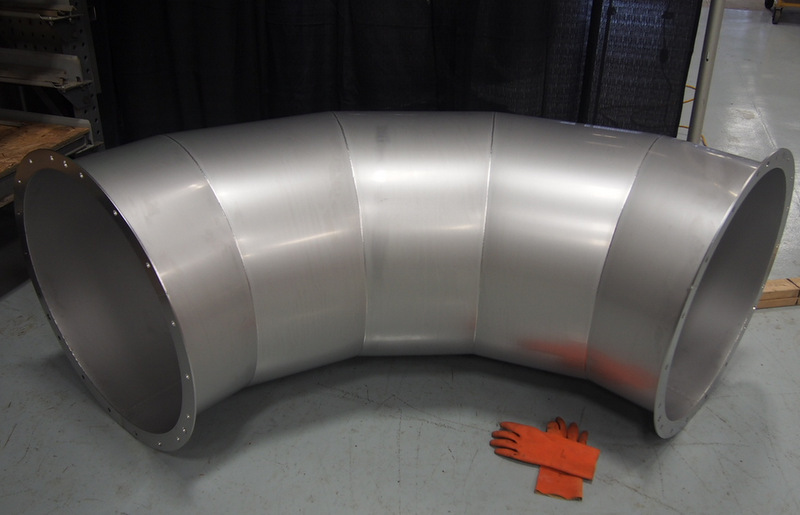 Our Ductwork is available in Stainless Steel, Aluminum, Galvanized, or Carbon steel. 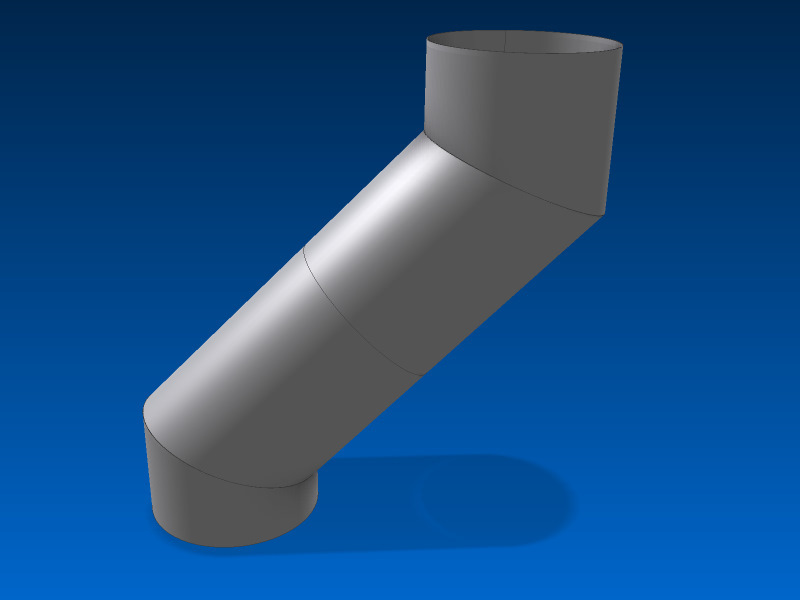 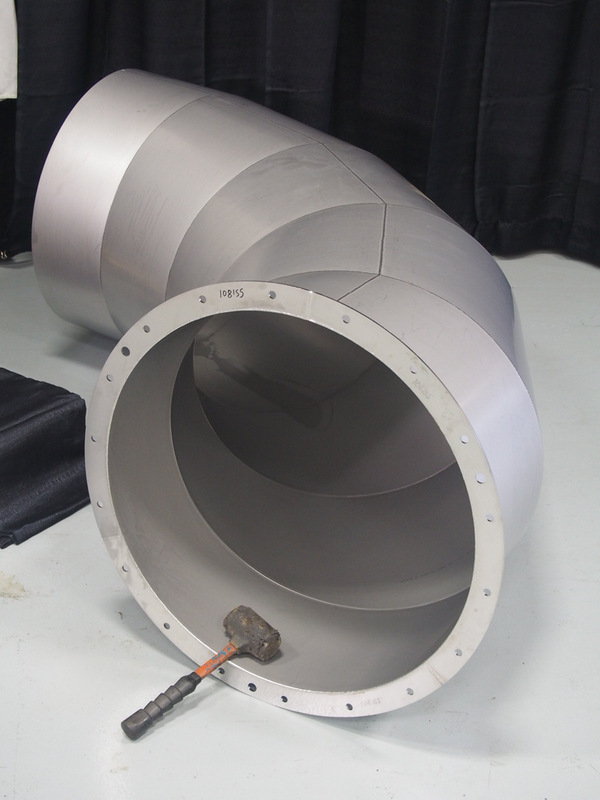 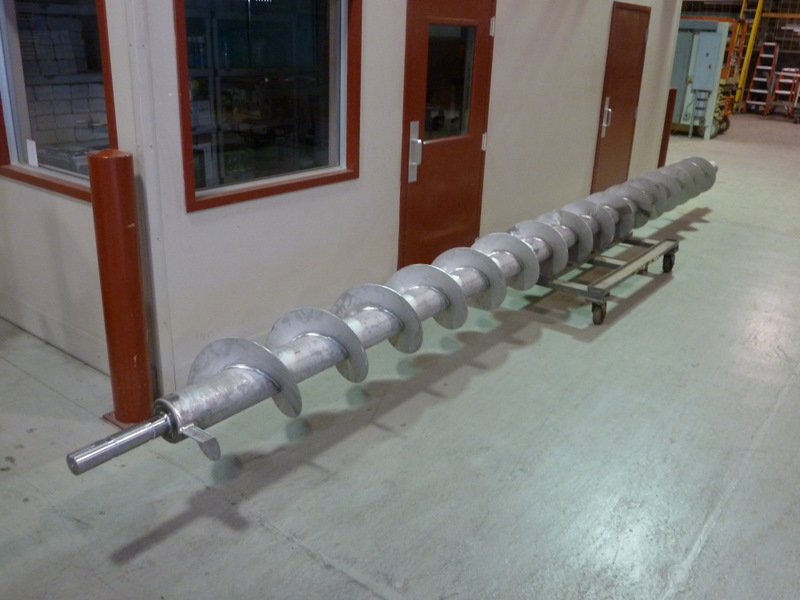 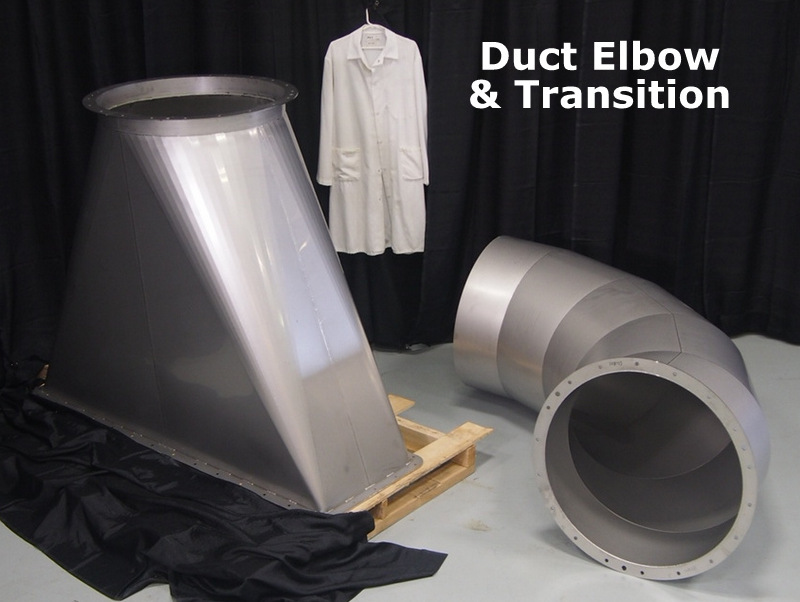 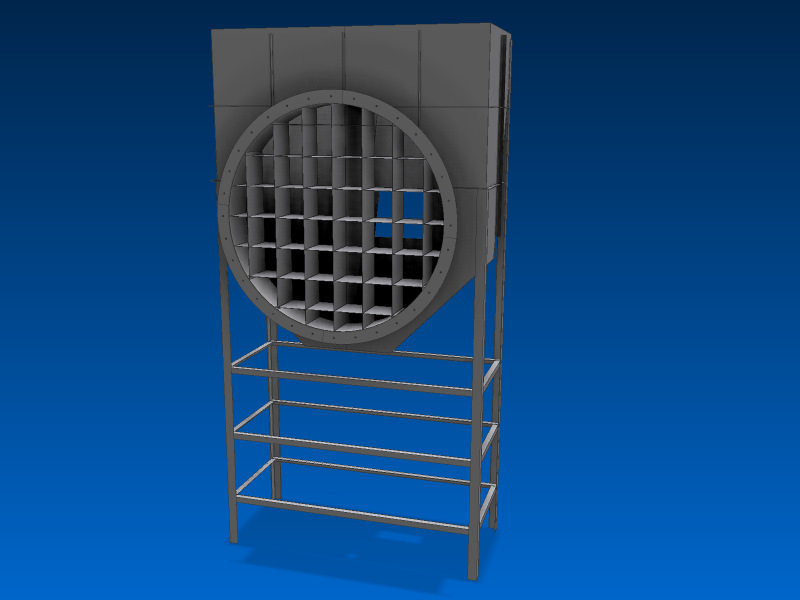 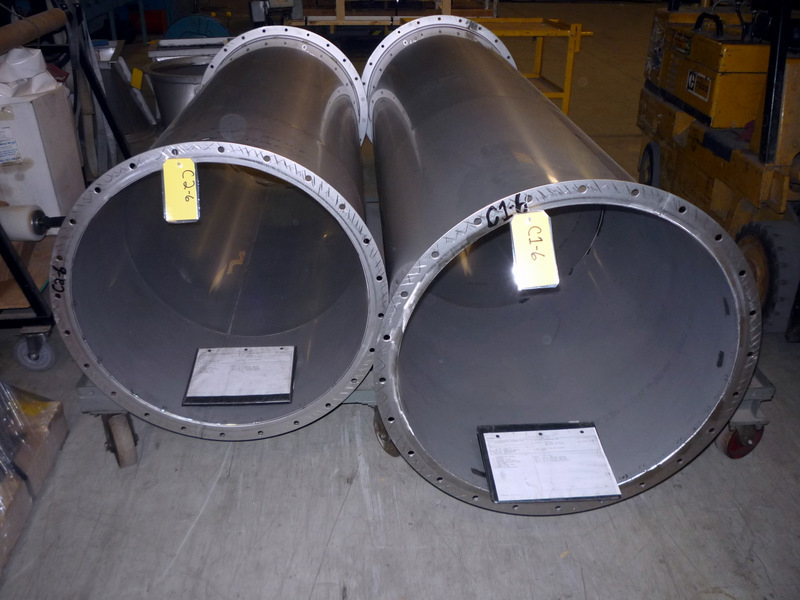 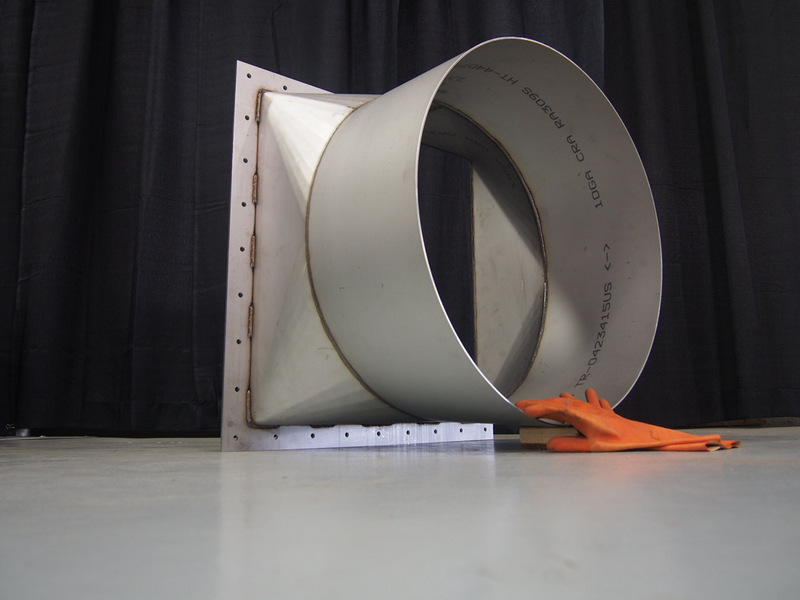 We have produced ducting in a variety of shapes, sizes, lengths and custom-fit configurations. 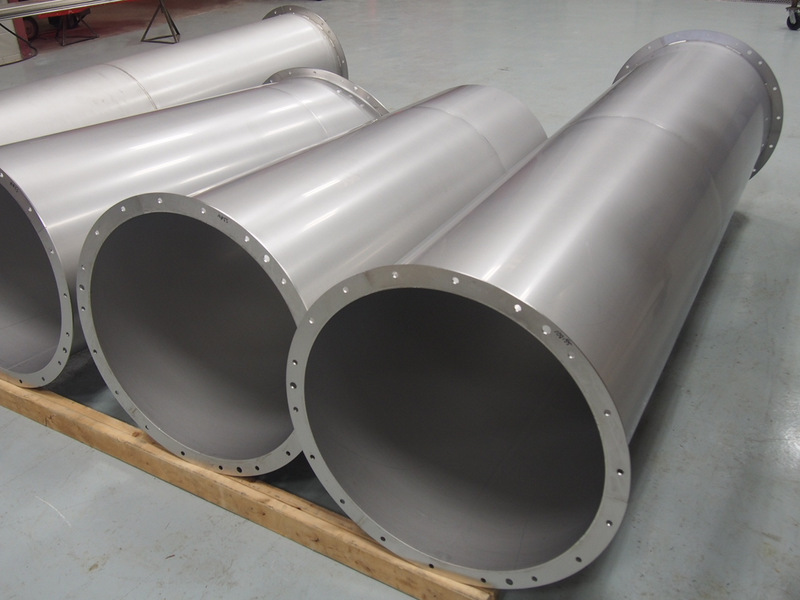 We provide the proper fit, drains, and flanges to make installation efficient and clean. 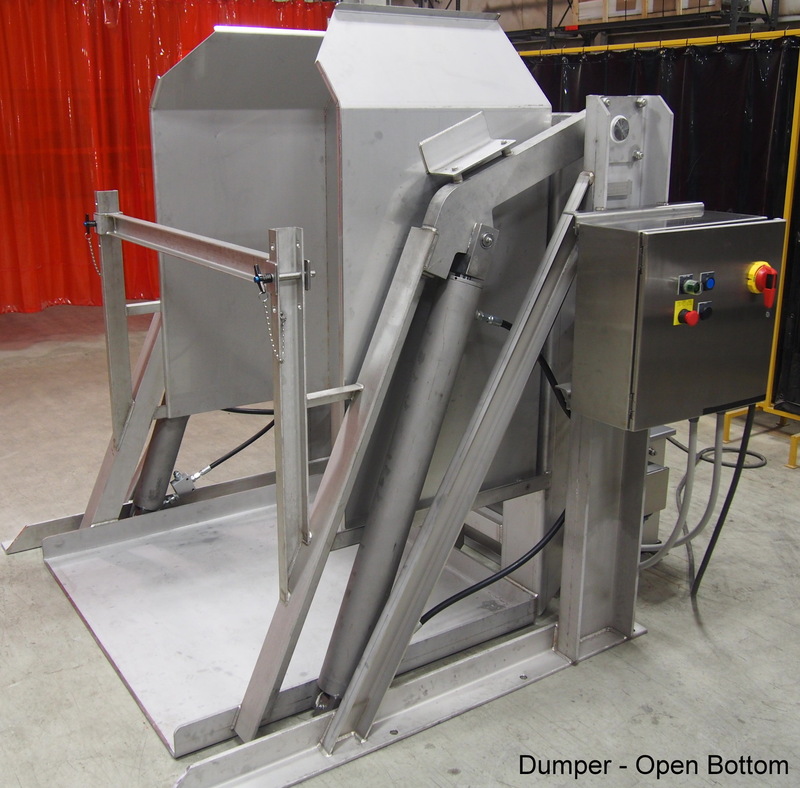 Our Dumpers and Electric High Lift Dumpers are custom engineered to meet your specific requirements. 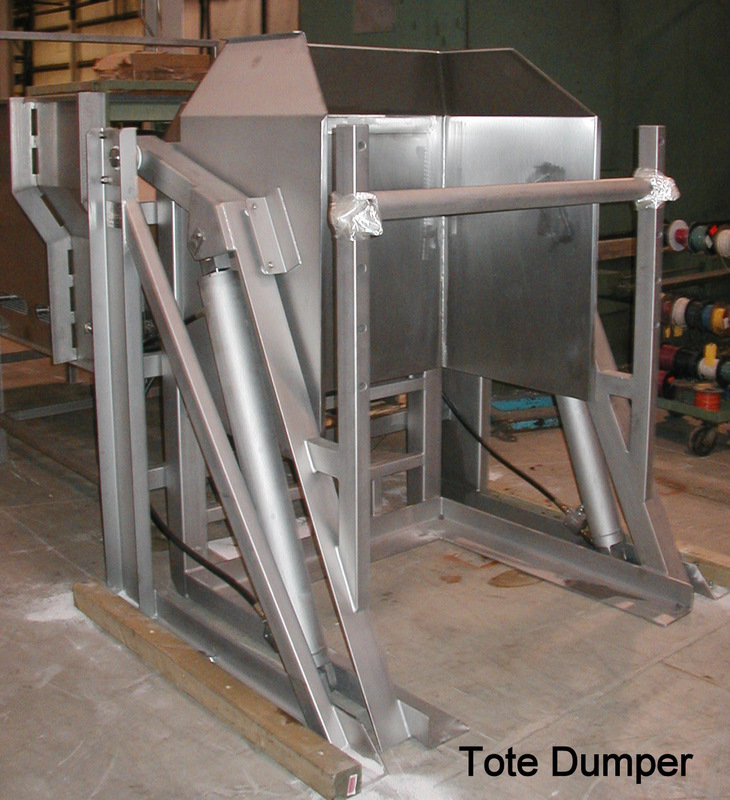 We offer dumpers and lifts for vats, combos, barrels, boxes, and pallets powered either by electric motors or hydraulics. 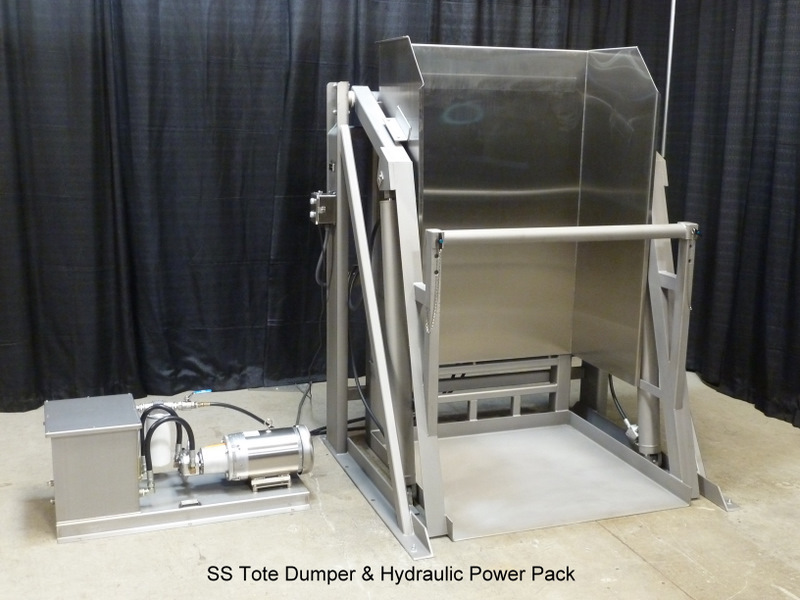 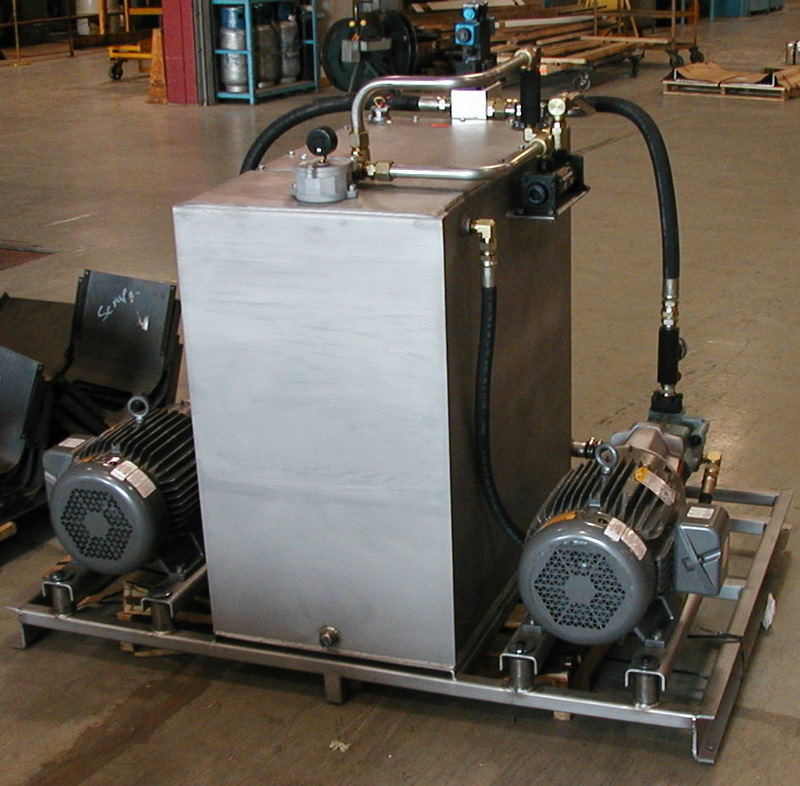 Our Hydraulic Dumpers as well as our stand-alone hydraulic power units are made from heavy duty stainless steel. 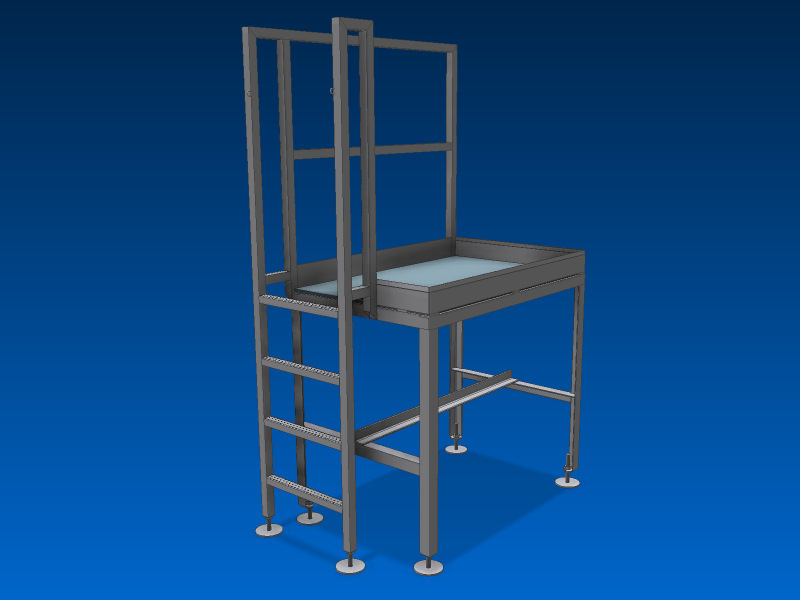 Our Electric High Lifts can be made to most any height you require. 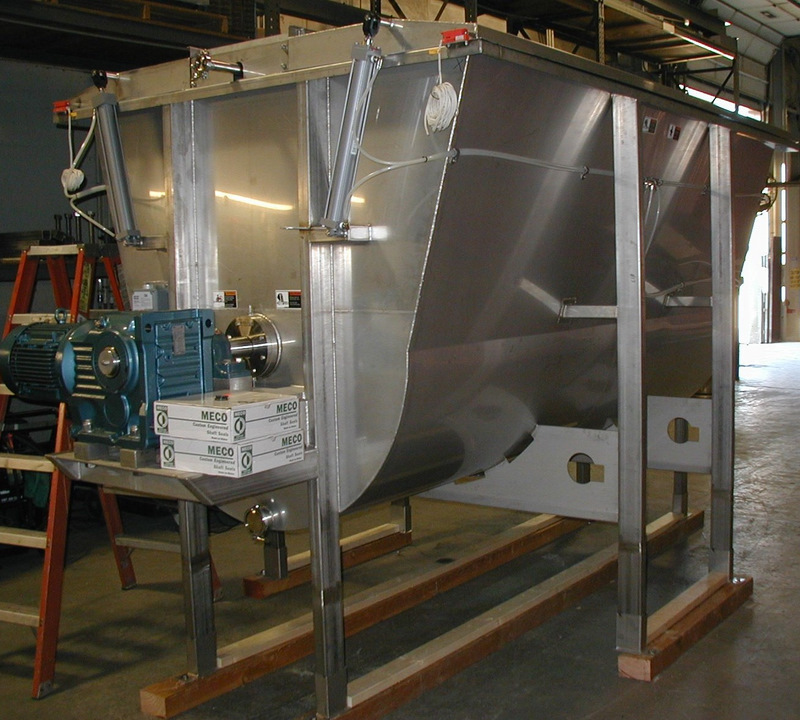 All our units are designed to meet your demanding needs with sanitary wash-down duty construction and the proper safety features to protect your personnel. 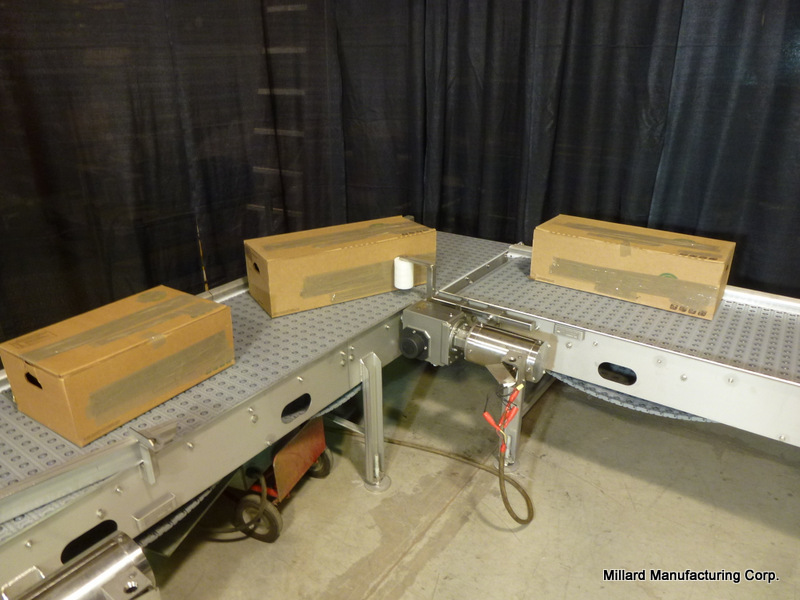 Millard offers Factory Acceptance Testing (F.A.T.) 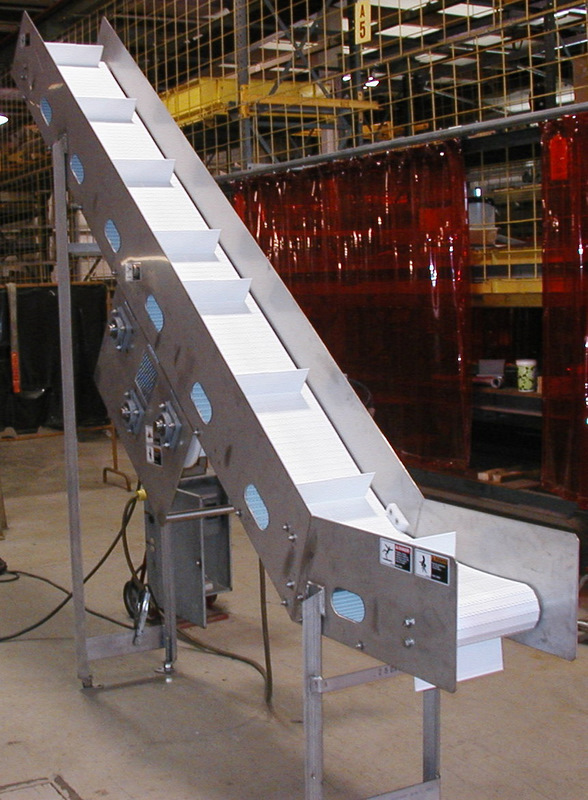 on most of our products should you or the nature of the product require it. 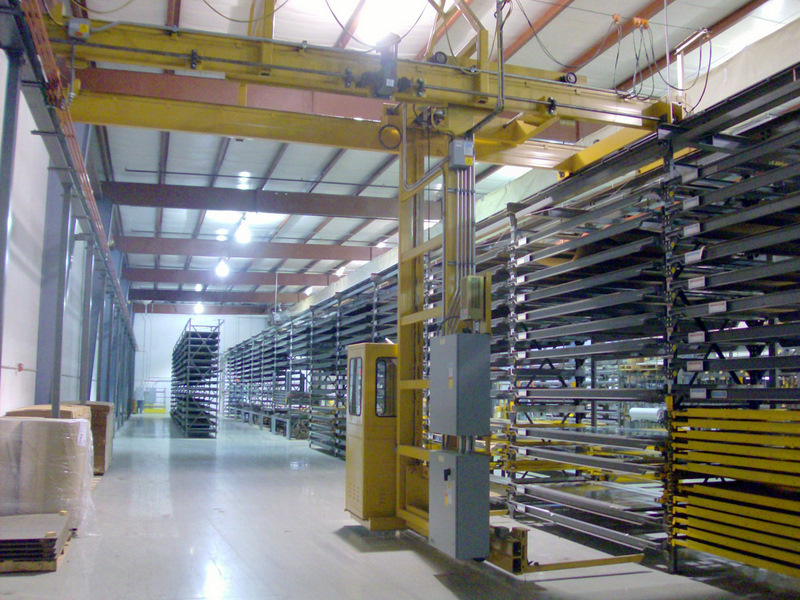 We have over 100,000 sq.ft. 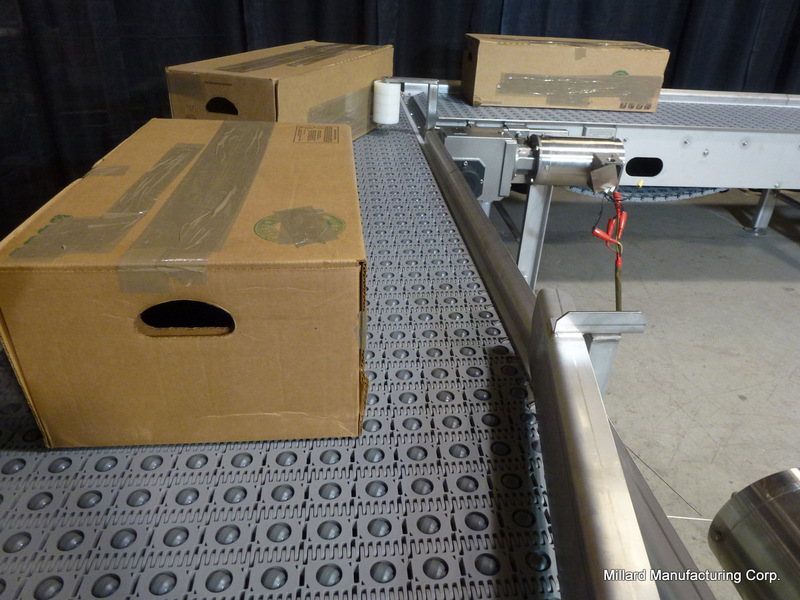 of floor space within our facilities to physically accommodate and simulate most production operations. 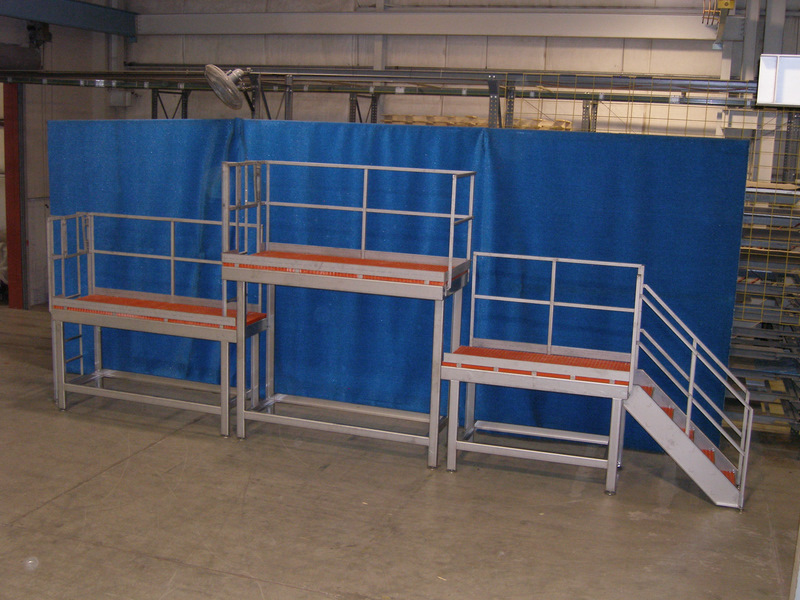 Our facility is specifically set up with large assembly bays for not only our manufacturing versatility but also to support F.A.T. 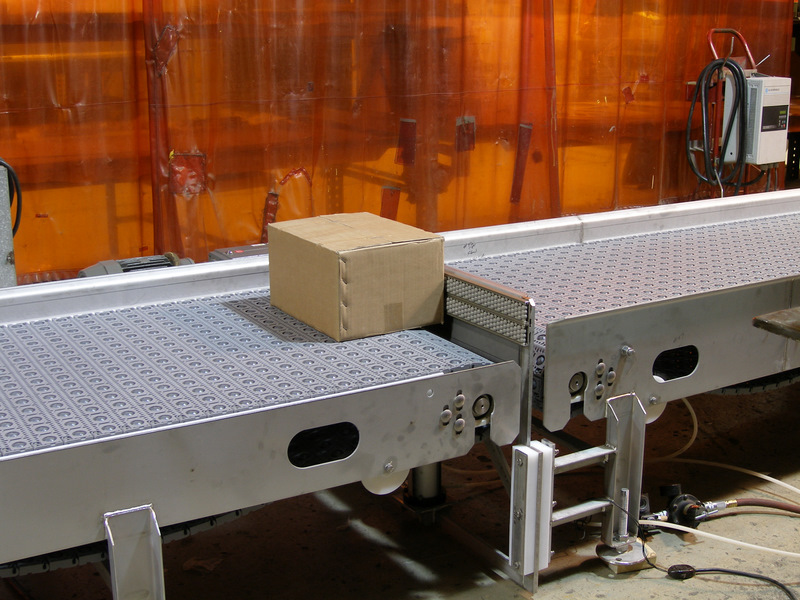 We can help to make sure products function properly before they ship. 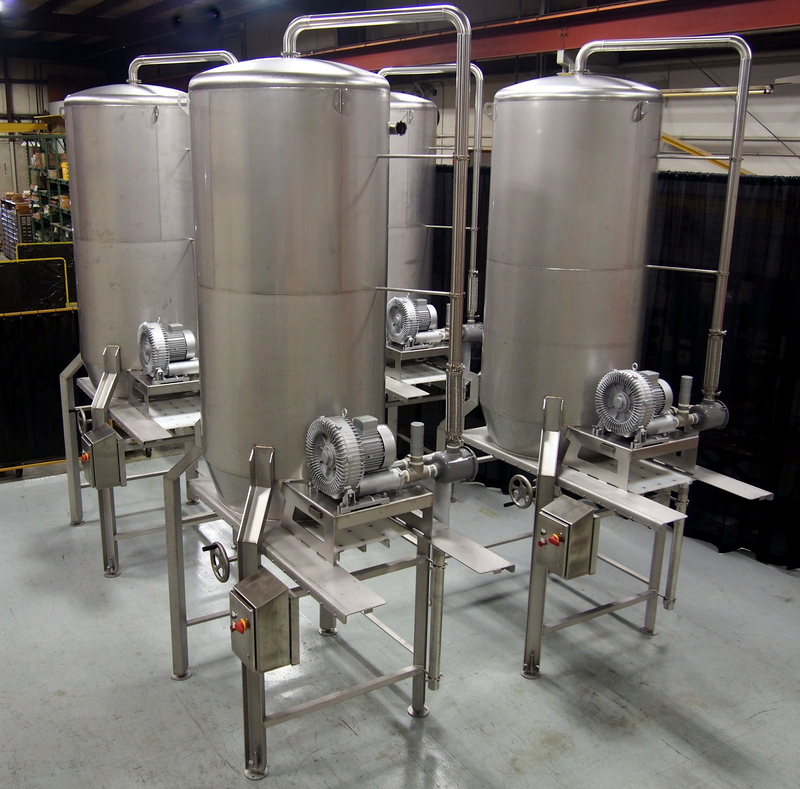 Our Fabrication Services not only supports the food processing industries but also many others including; OEM, Pharmaceuticals, Public Works, Tooling Shops, Machine Shops, Corn Processing Plants, Ethanol Plants, Waste Water Facilities, Chemical Plants, Animal Health, and Private Business. 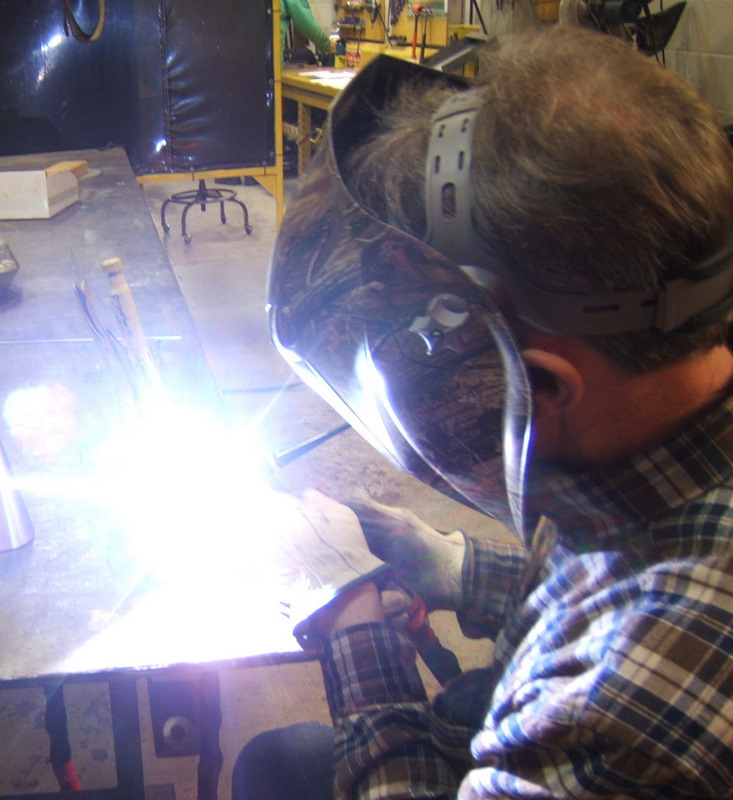 Having a Metal Services Supplier at our disposal provides Millard with a unique advantage in getting most projects started quickly. 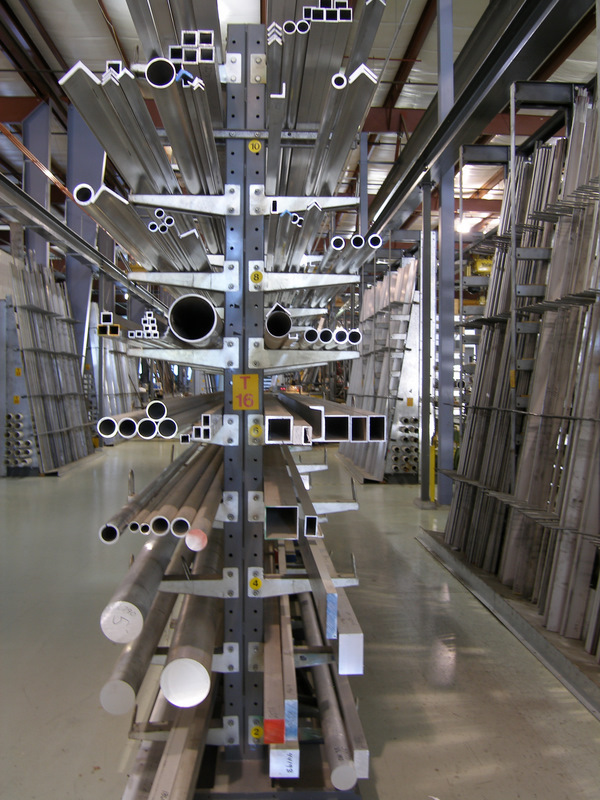 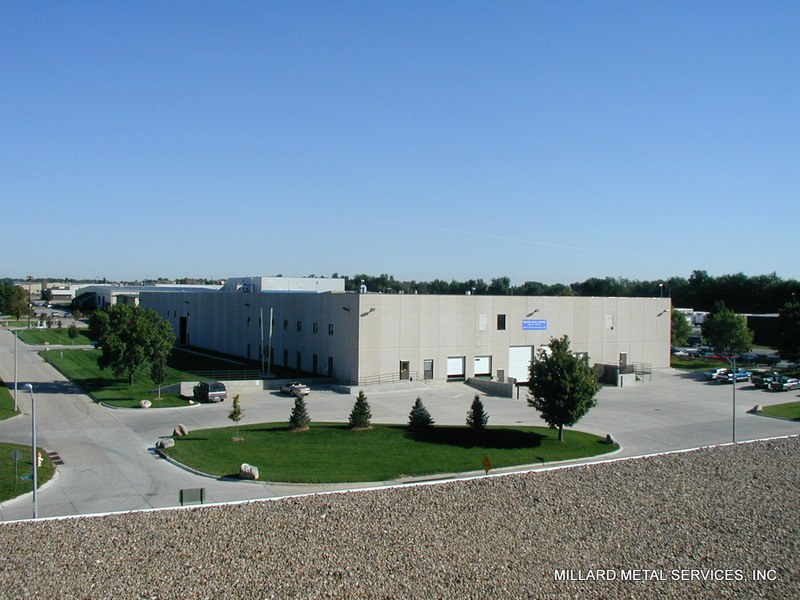 Millard has the knowledge, facilities, and engineering to work with you for all your fabricating needs. 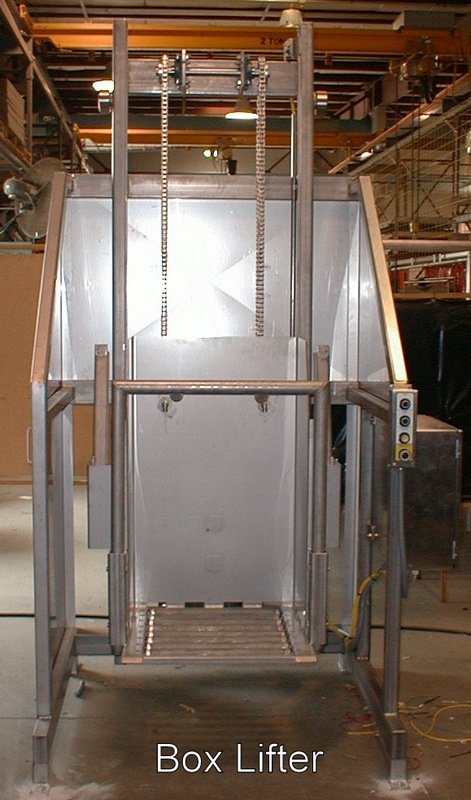 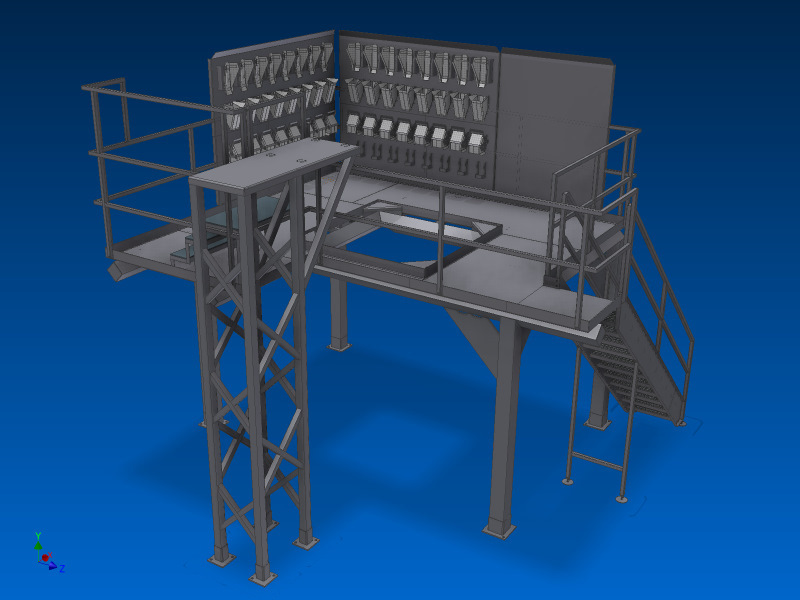 Millard can provide you with safe and sanitary Hydraulic Lift Platforms for operations and inspection personnel to assist them in their work. 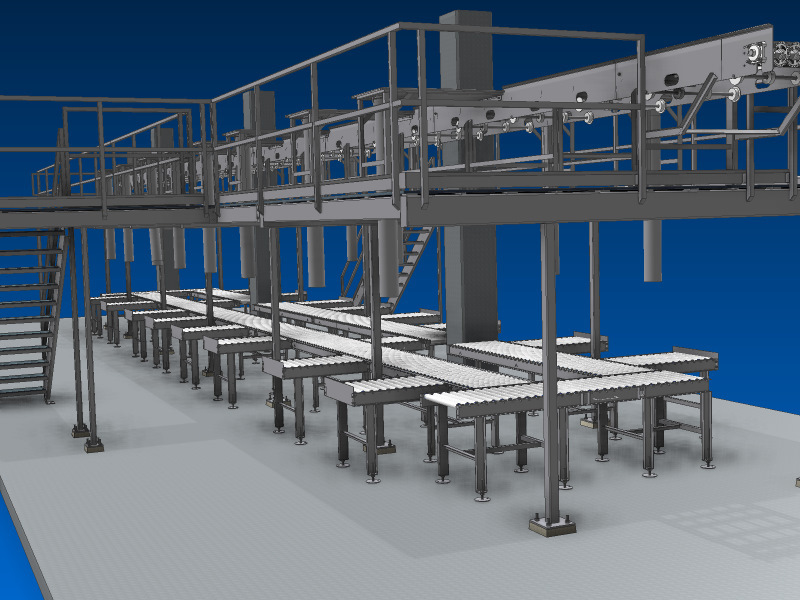 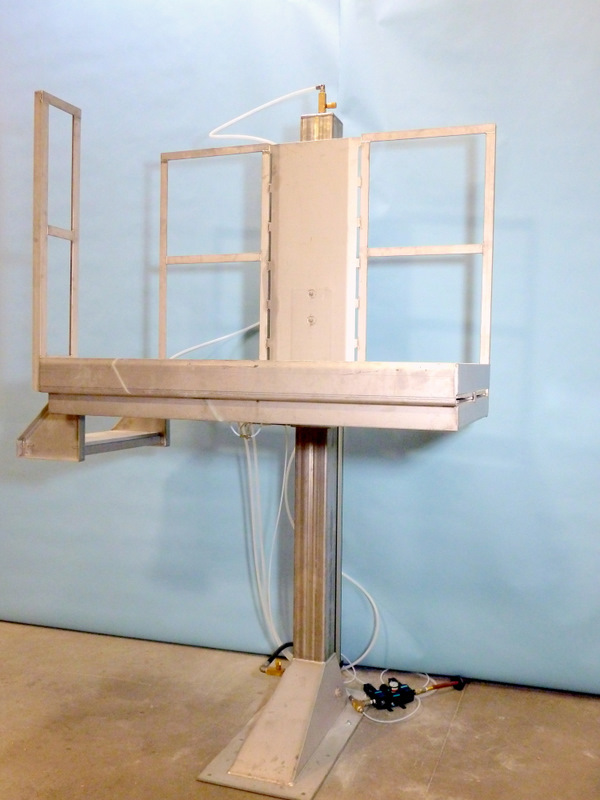 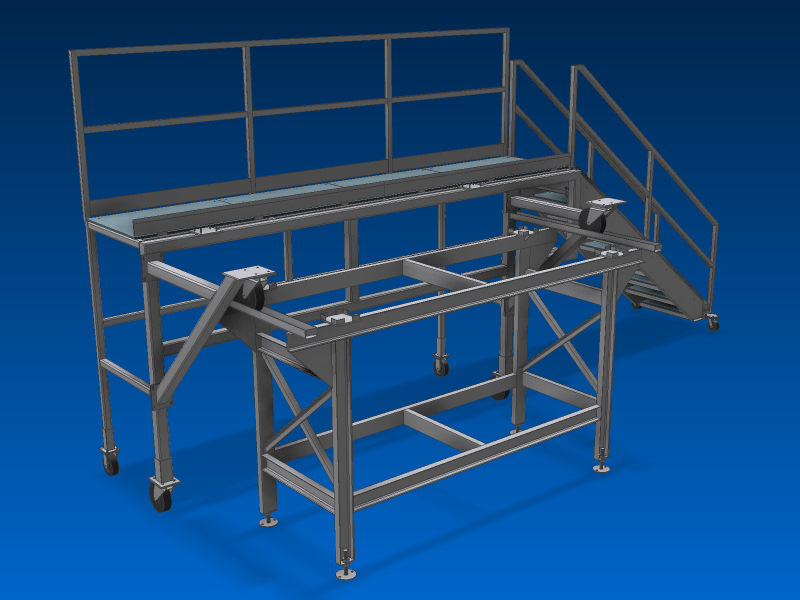 We will work with you to custom design, build, and install the proper lift platform to fit your process application. 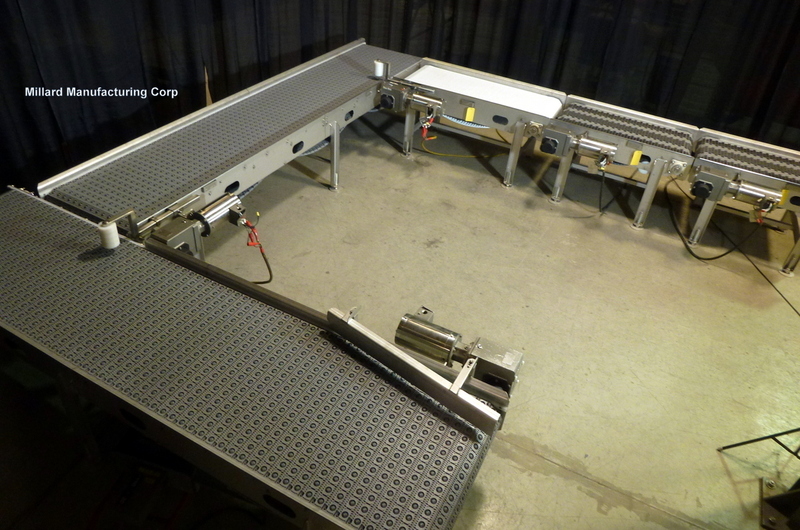 Our platforms come complete with hydraulics and controls. 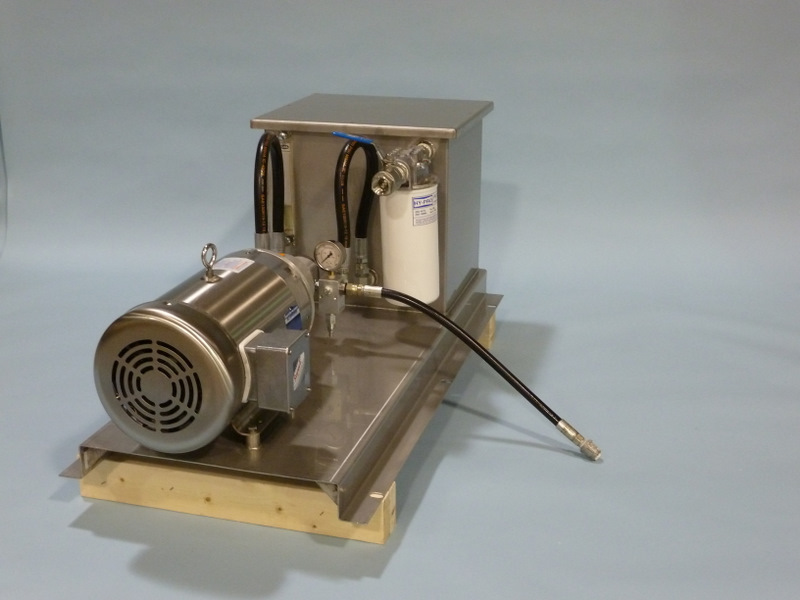 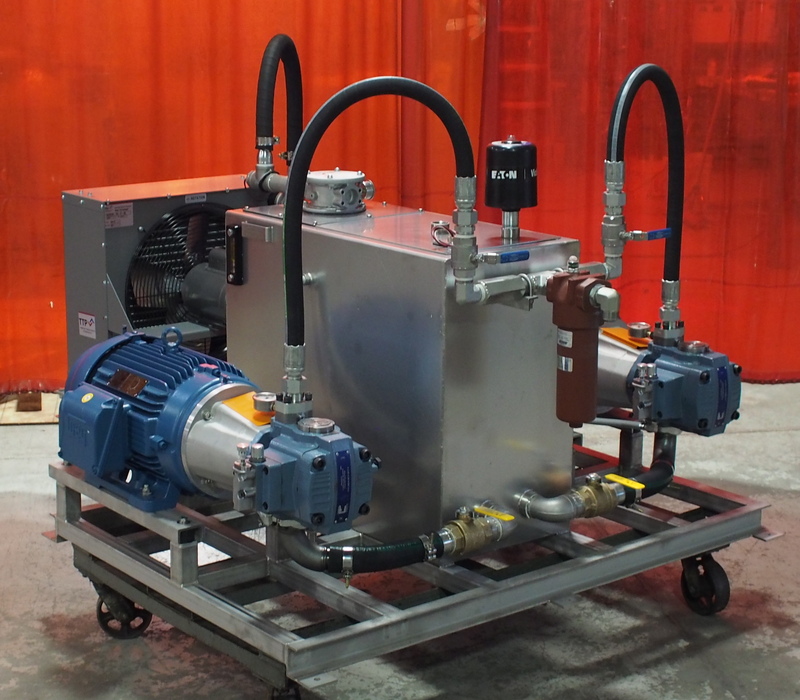 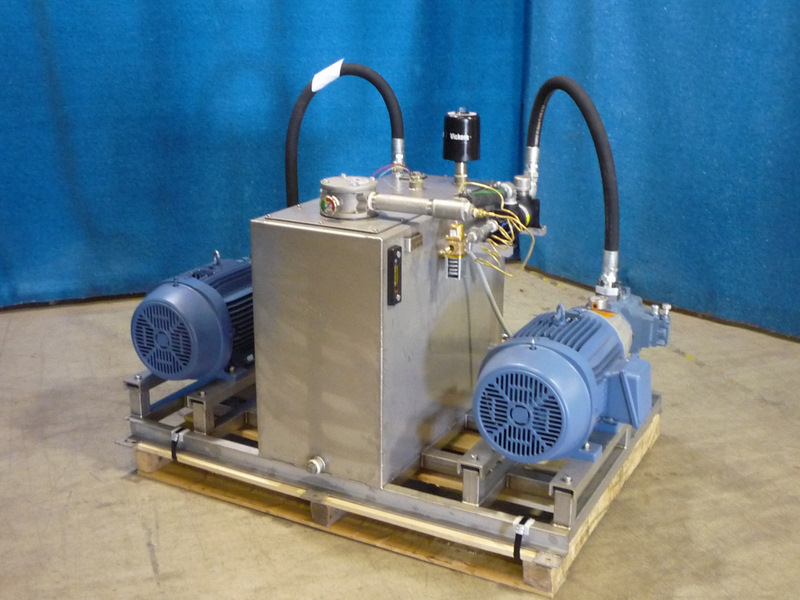 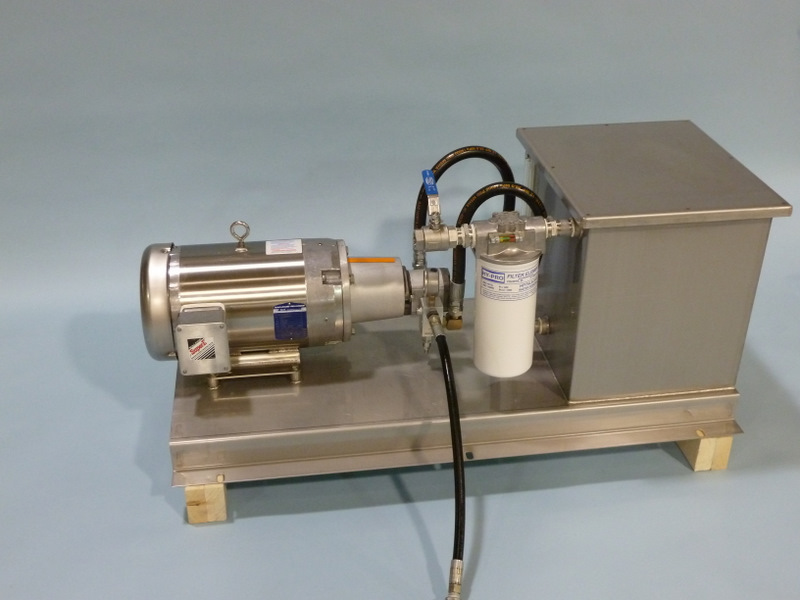 Millard has made many variations of Hydraulic Power Units and our designs have evolved to be simple to use and easy to install. 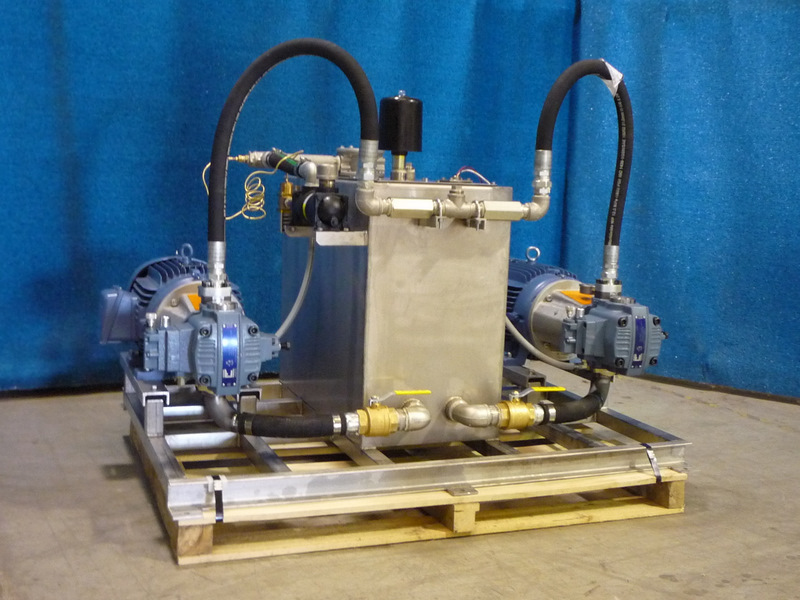 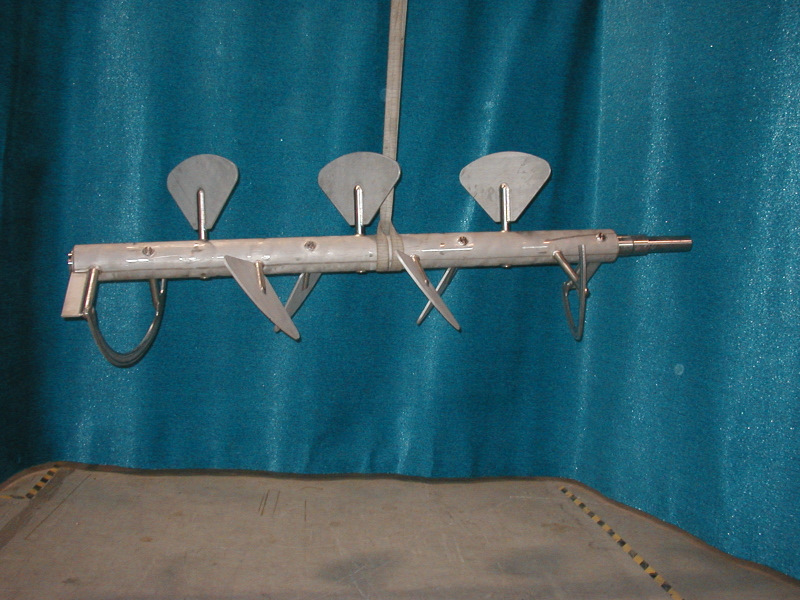 Our units are all Stainless Steel with fluid site gauges, pressure gauges, and high pressure hoses. 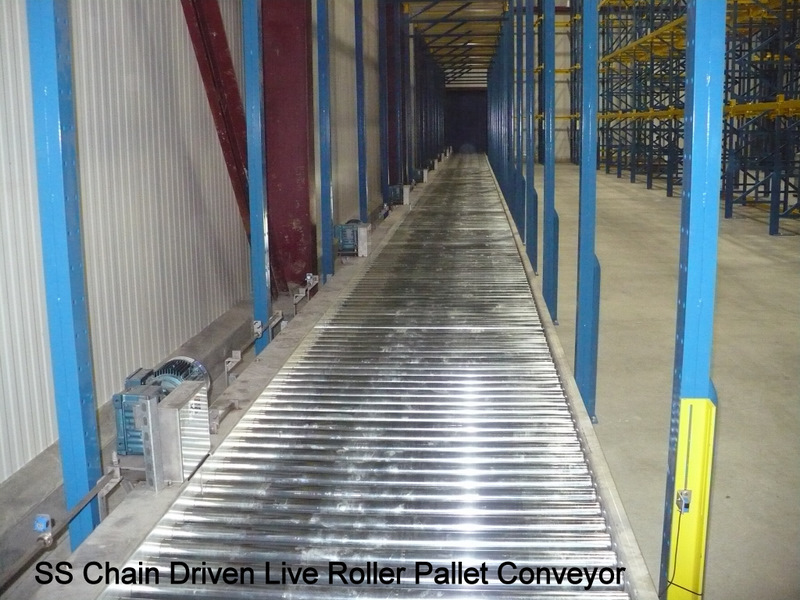 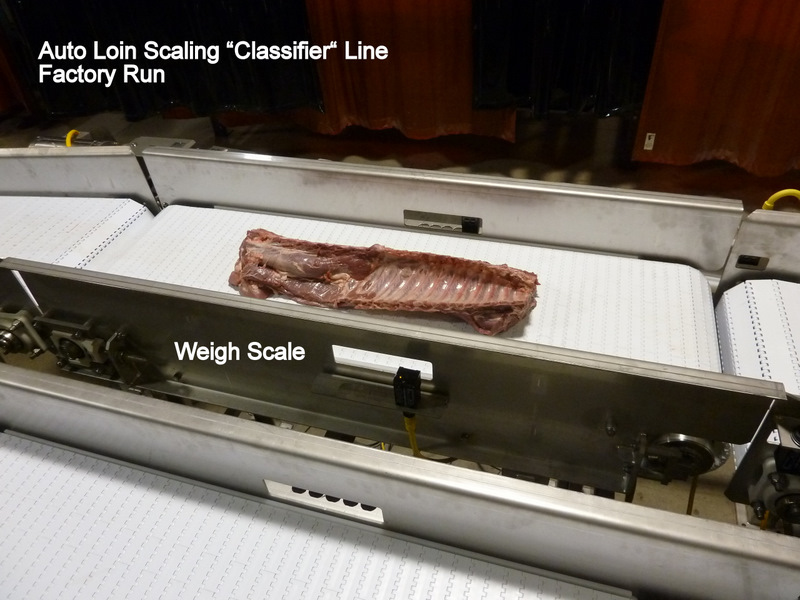 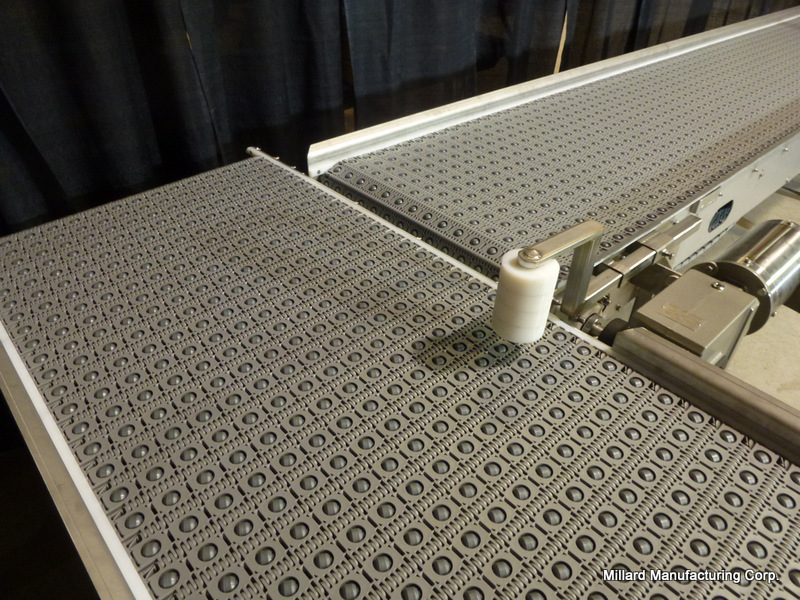 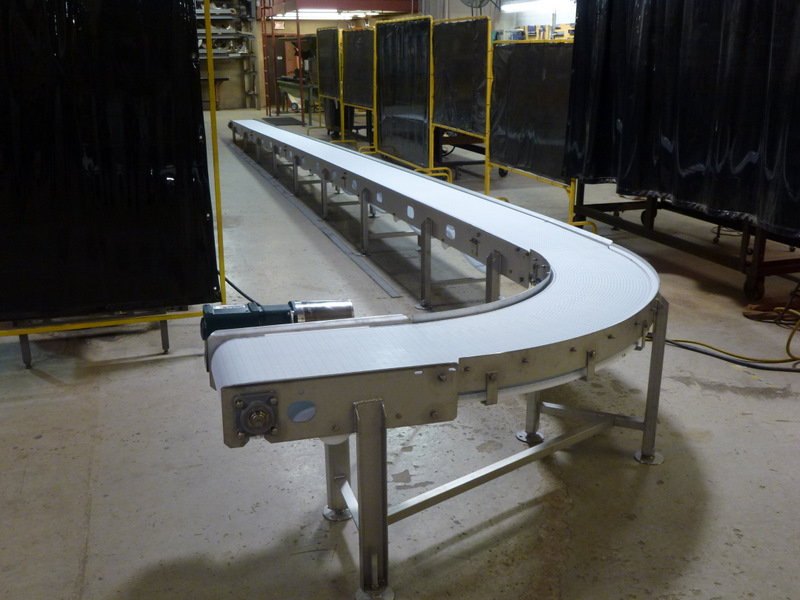 We are a licensed manufacturer and licensed supplier of conveyors employing Intralox Activated Roller Belt (ARB™) technology. 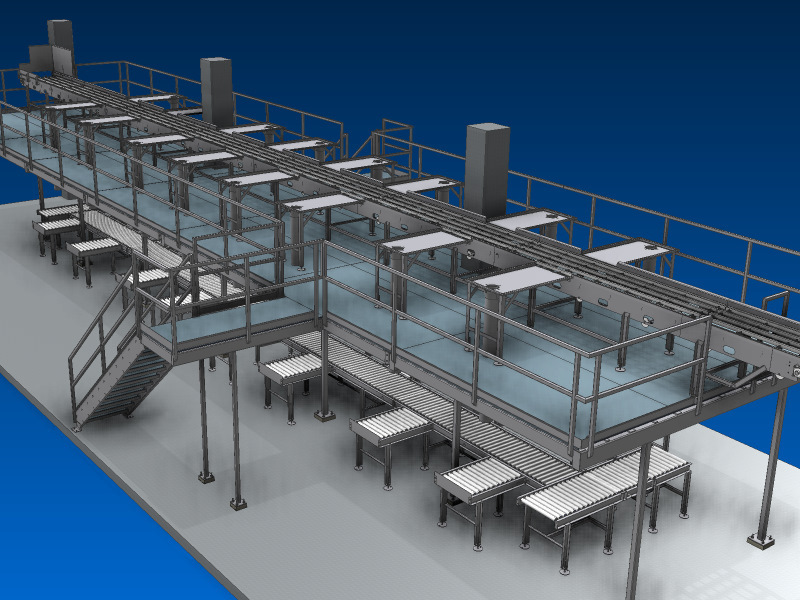 ARB technology is used to automate process flow and can be applied to a wide range of applications for turning product, 2 to 1 and 2 to 2 switching, merging, diverting, sorting, dividing, aligning, and 90 degree transferring. 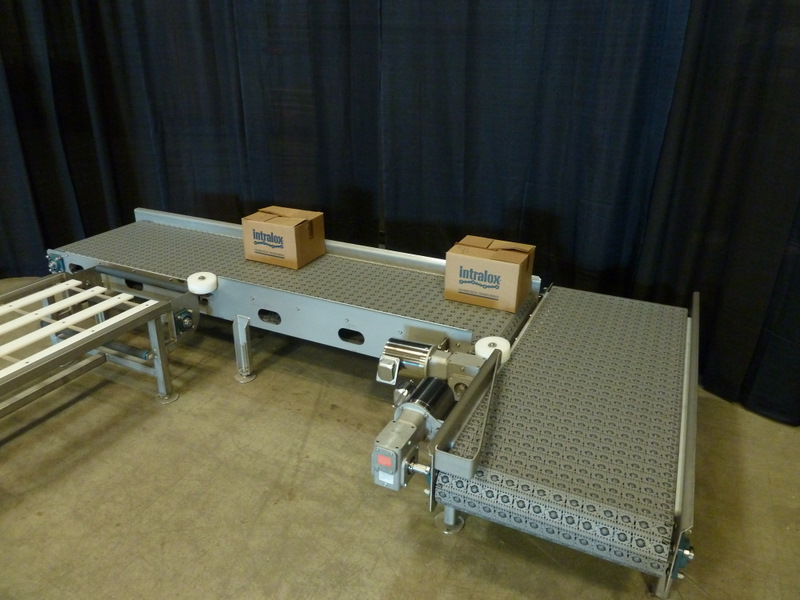 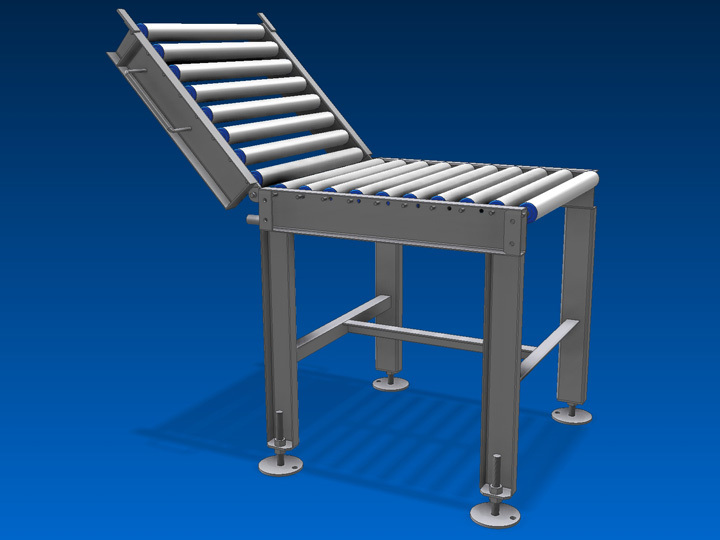 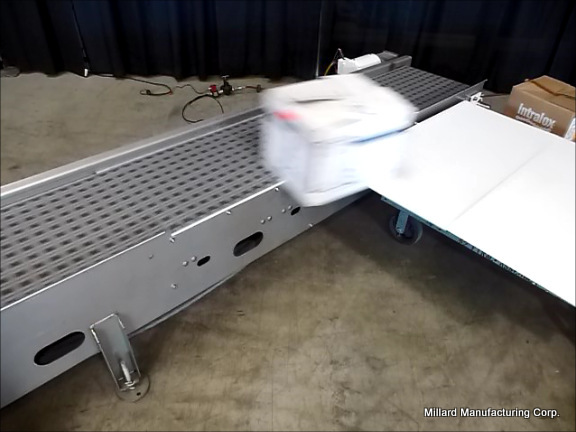 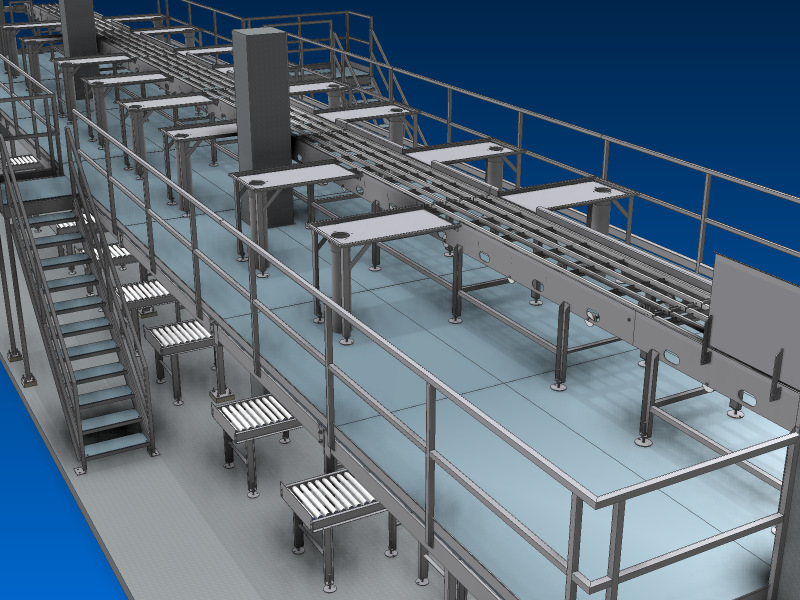 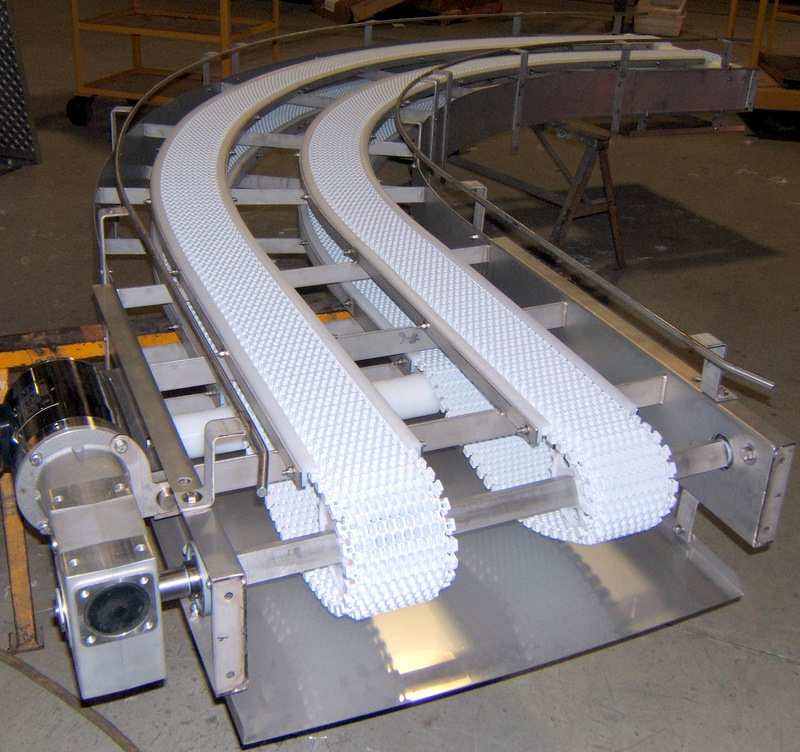 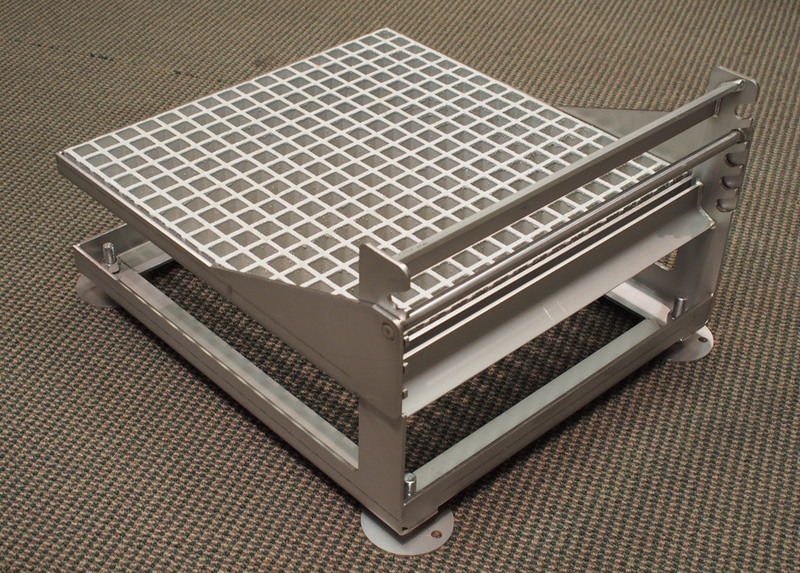 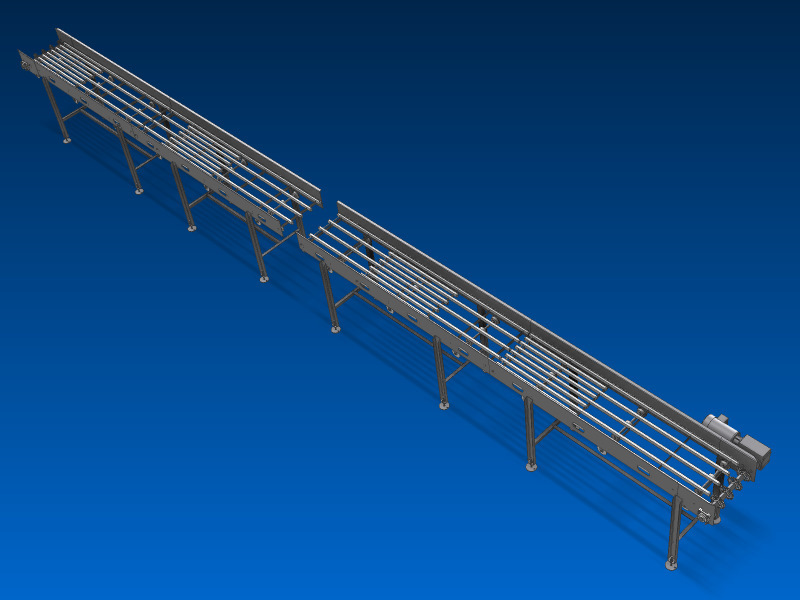 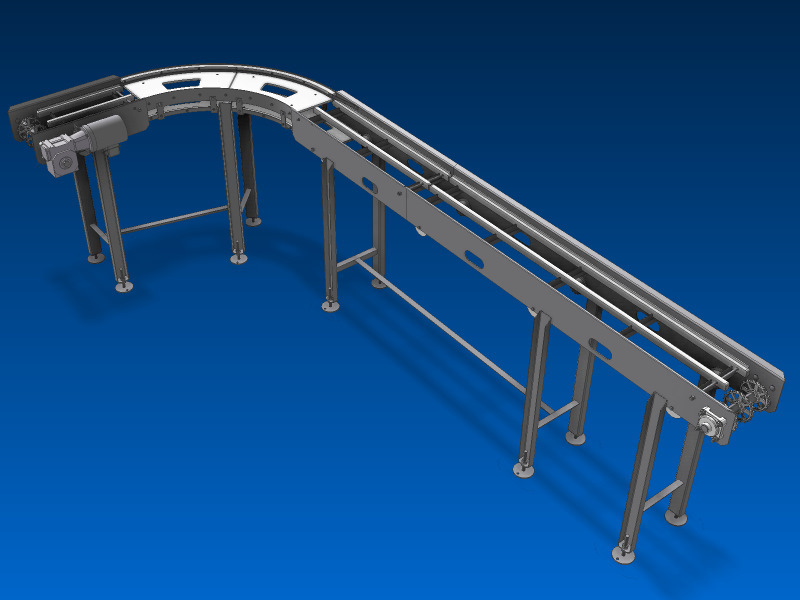 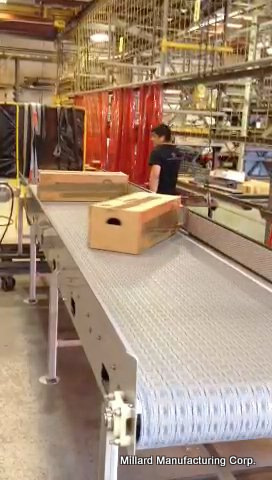 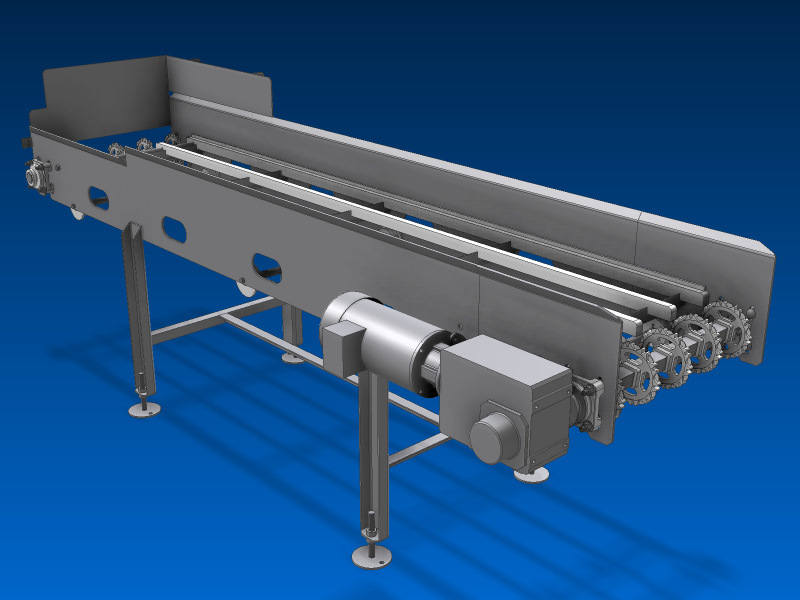 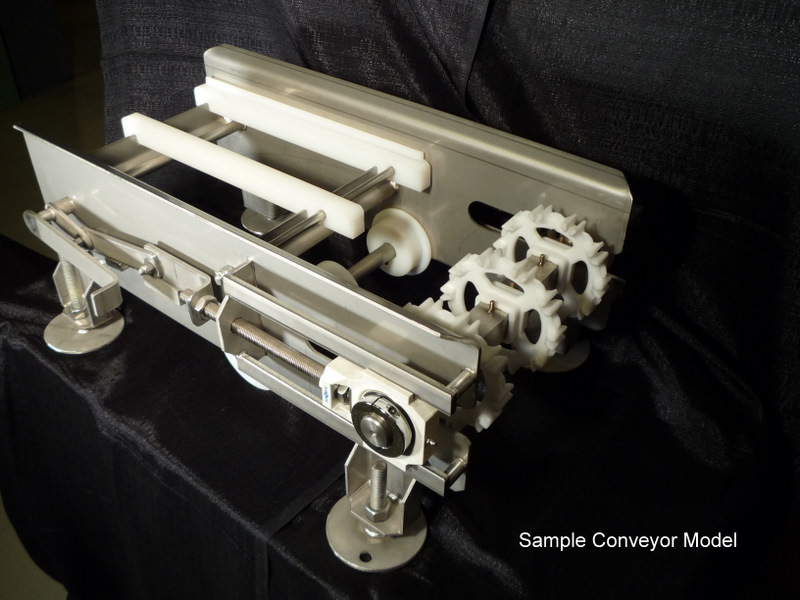 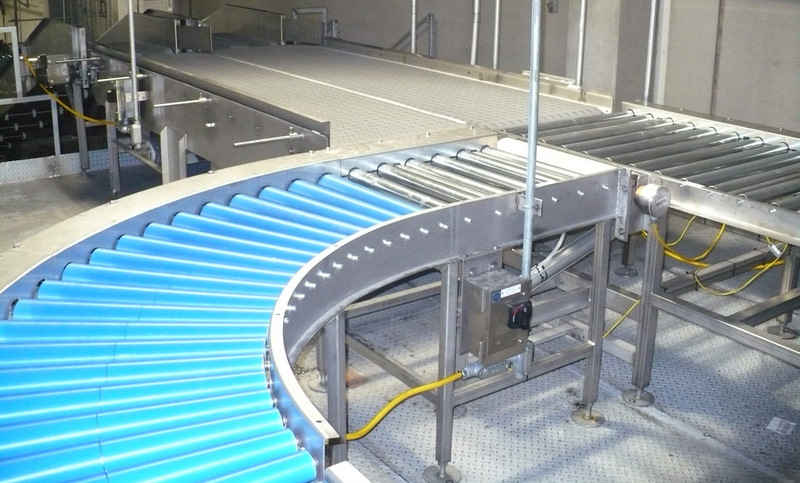 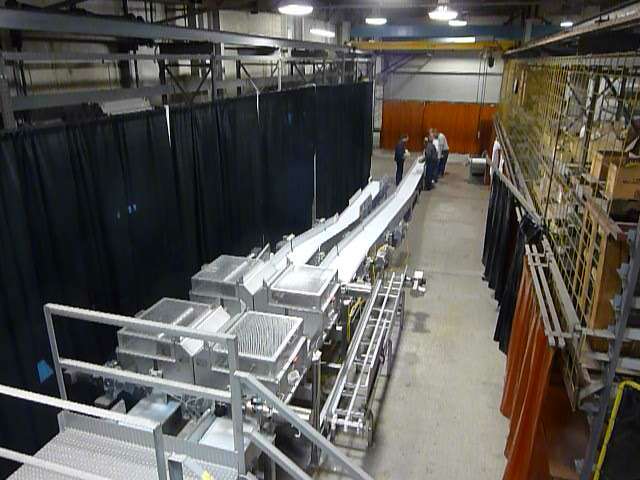 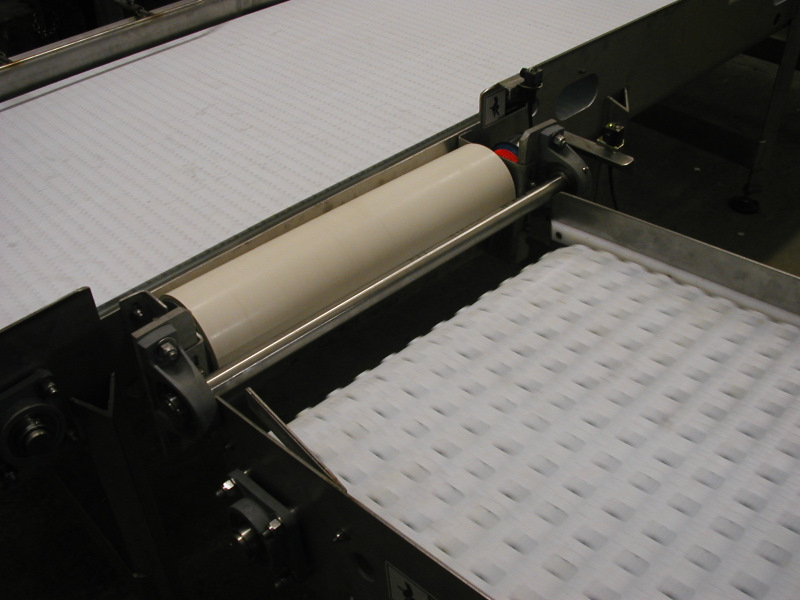 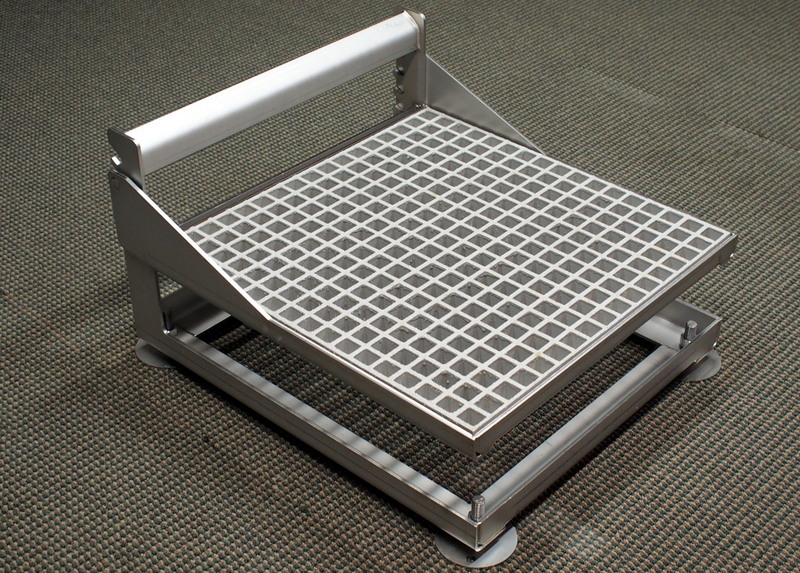 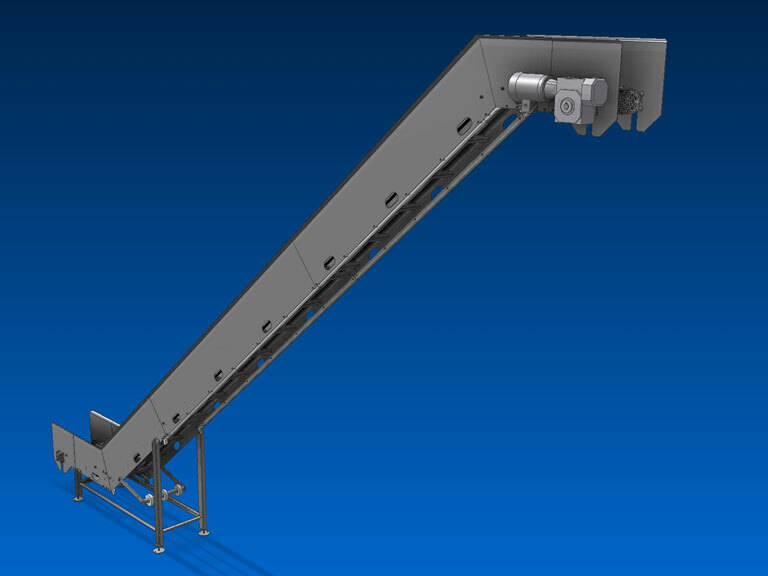 Millard and Intralox can custom design a box conveyor for your specific application that will include the standard features of our heavy duty sanitary belt conveyors. 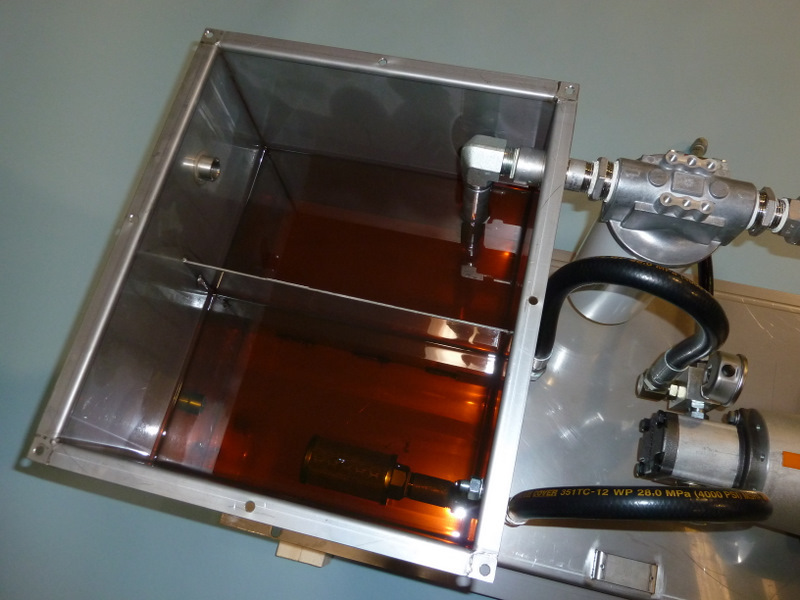 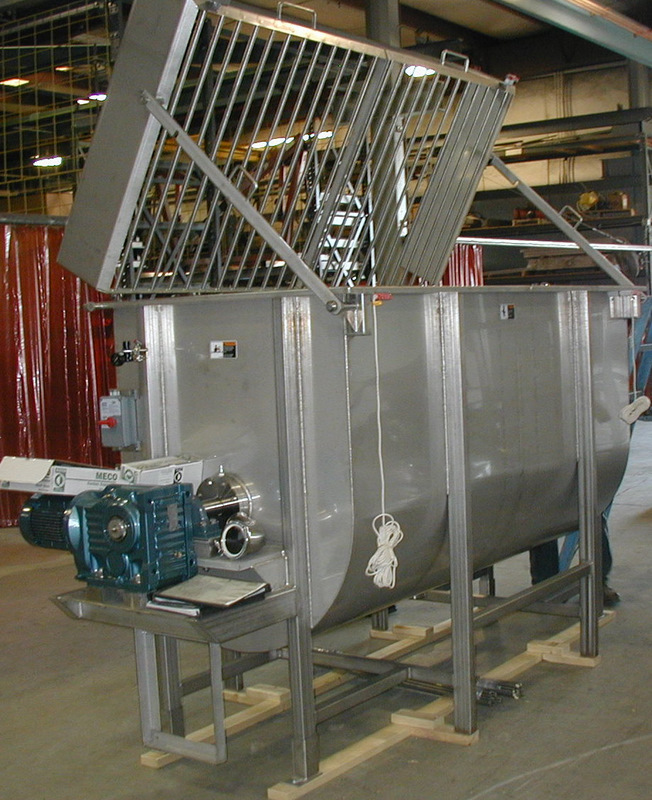 Millard PassPRO™, our large "In-House" Passivation operation, is available for our customers' fabricated items. 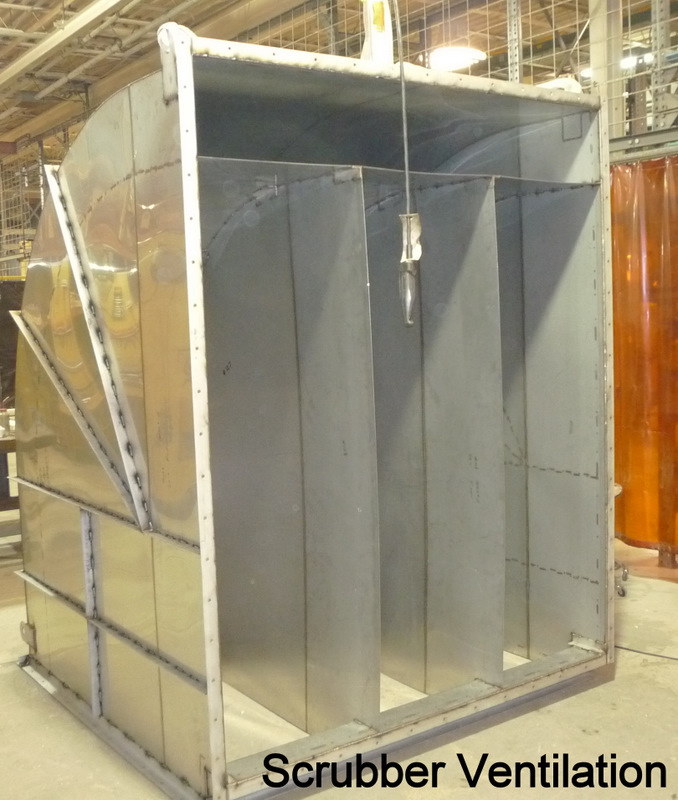 We place a high priority on Sanitation in both our designs and fabrication processes which is why we have incorporated this process as a standard and can be found in our "Safety and Sanitation Design Standards". 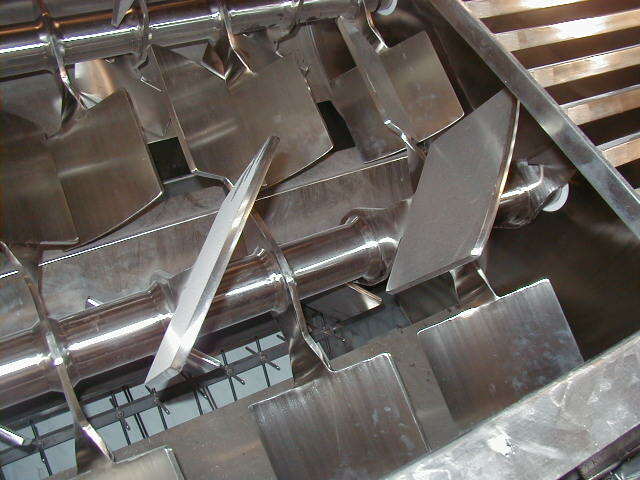 Passivation treatment is intended to improve the surface condition of stainless steel by dissolving iron that has been embedded in the surface during forming or machining. 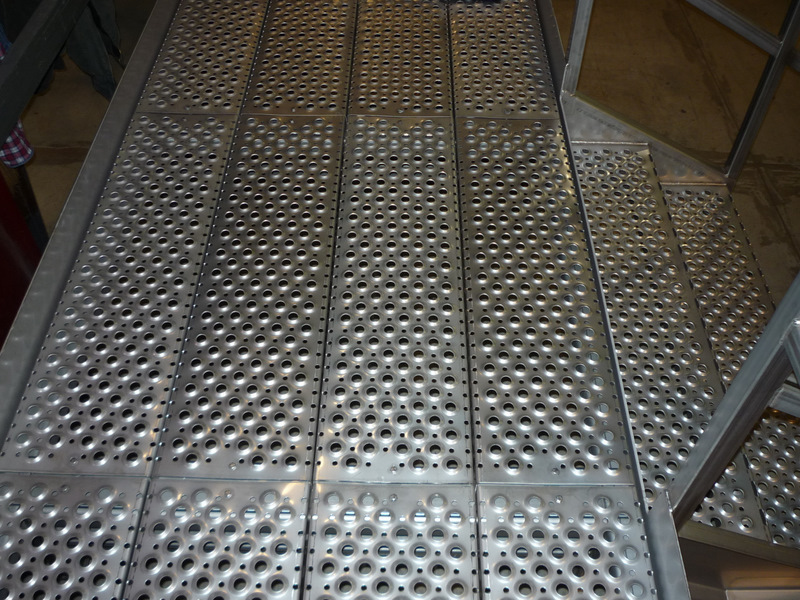 If allowed to remain, the iron can corrode and give the appearance of rust spots on the stainless steel. 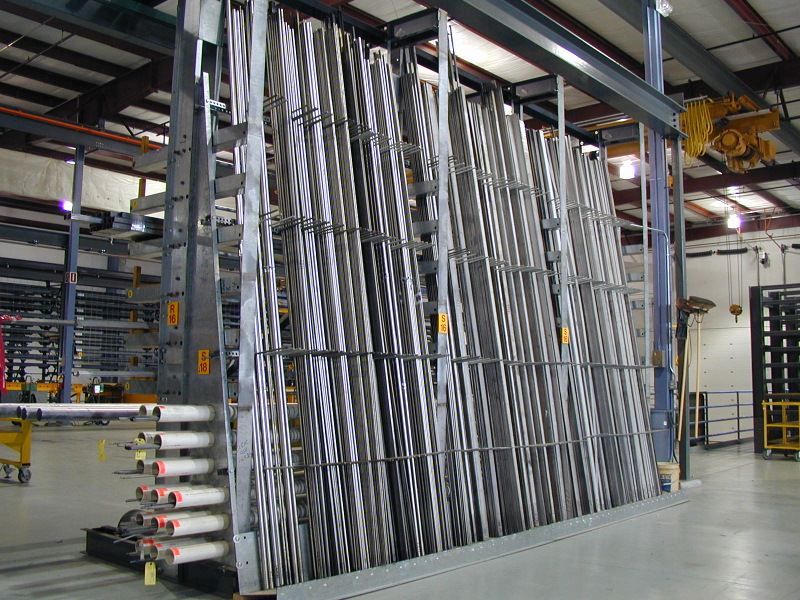 Passivation restores the original corrosion-resistant surface by forming a thin, transparent oxide film. 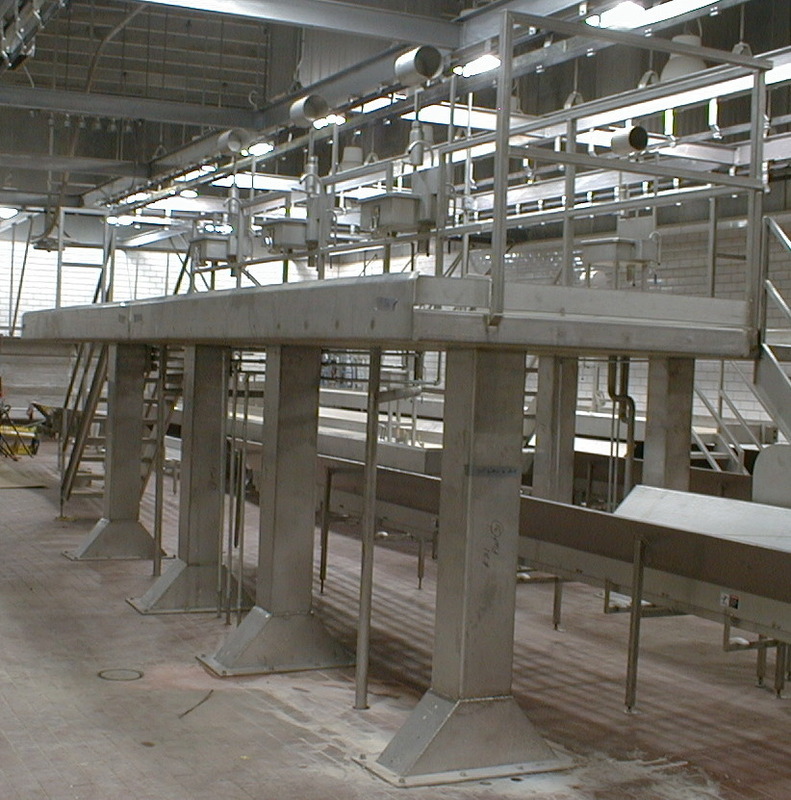 Passivation is the preferred method for the sanitary durability of stainless steel. 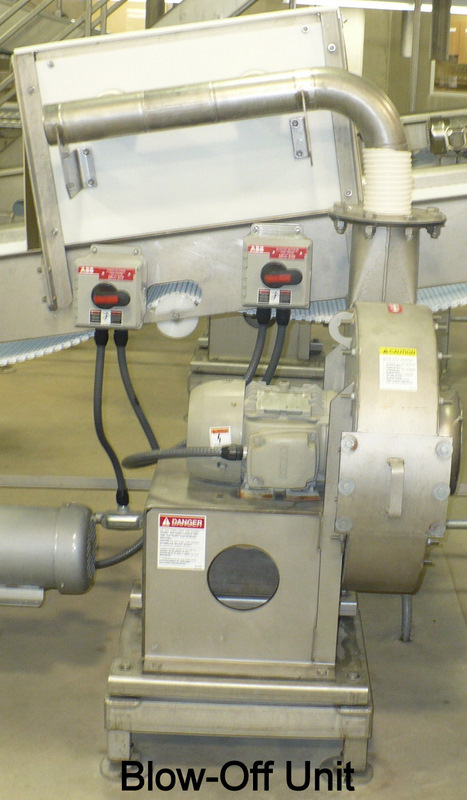 Food Processing can require frequent blending and mixing of ingredients to obtain a final product. 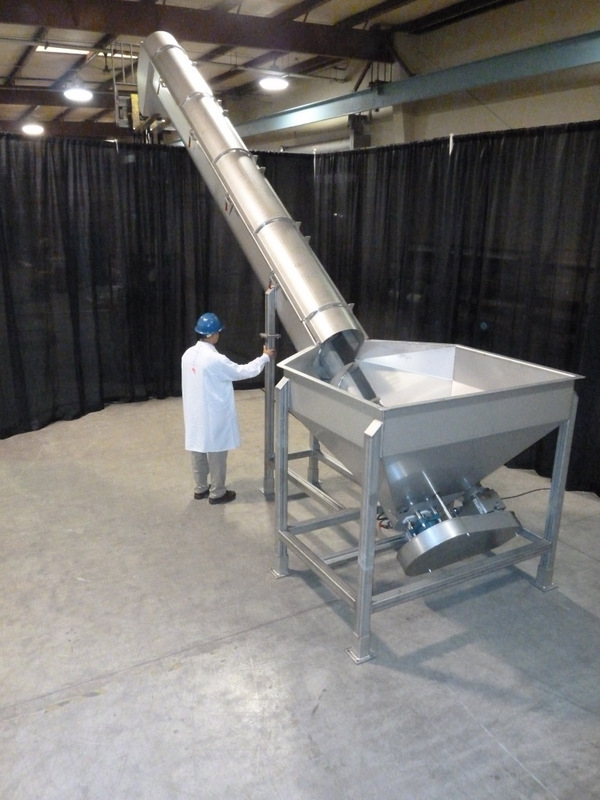 Millard is experienced in manufacturing custom Mixers and Blenders, as well as Cooking Kettles, Mixing Kettles, and Box Shakers, to support food processing applications that tend to be very product specific in design. 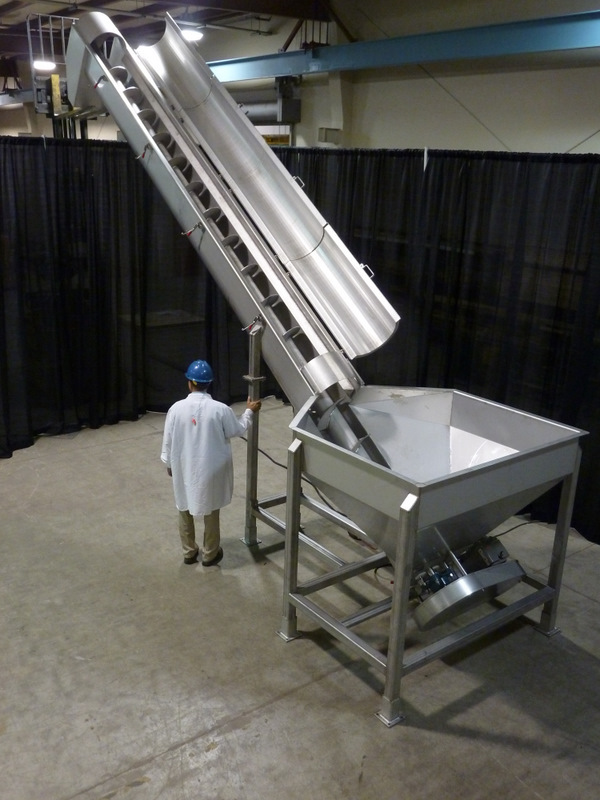 The size, shape and combination of mixing and blending can be custom designed to meet your needs. 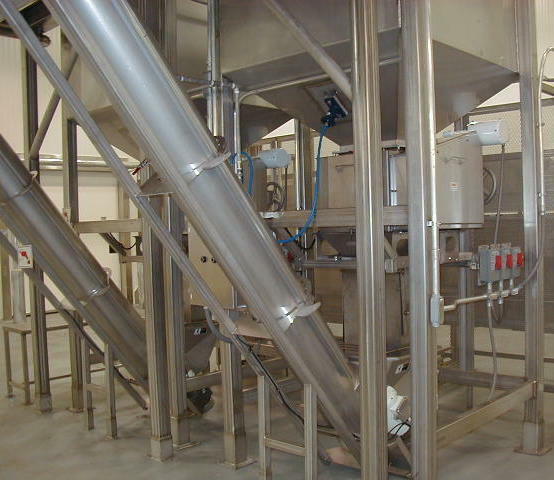 We can help you develop the right machine to blend or mix your ingredients then engineer it for production. 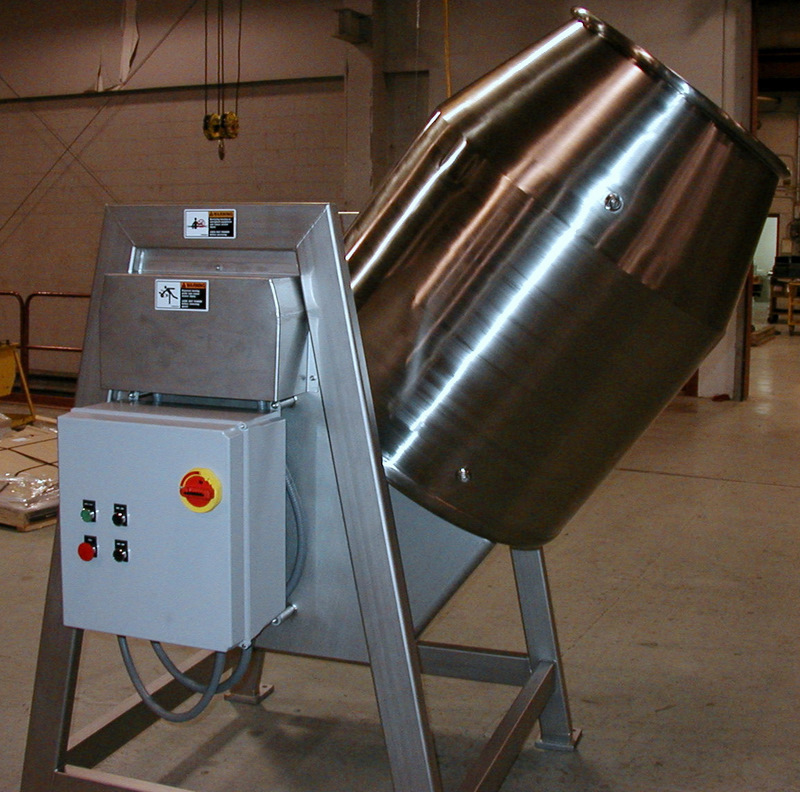 Our machines are built to last with heavy duty stainless steel, sanitary and wash-down duty construction. 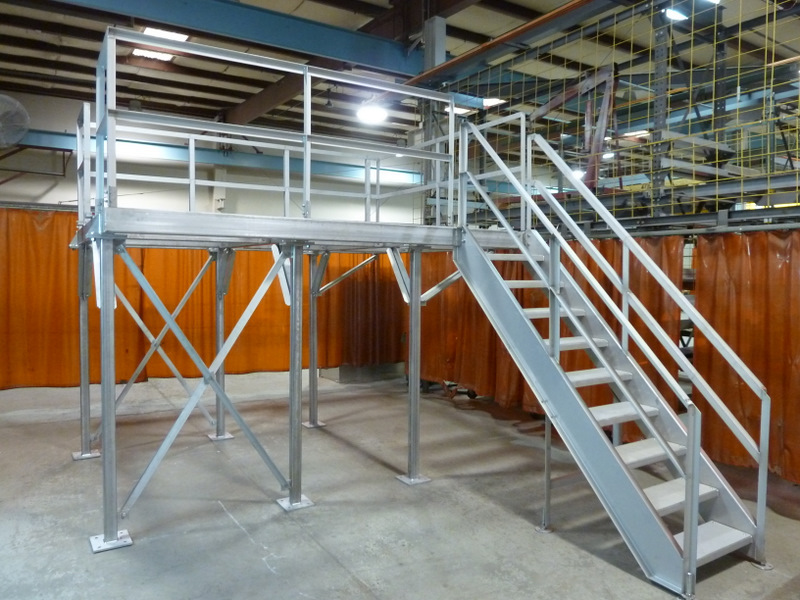 Millard can design, build, and install custom Platforms, Stairs, Mezzanines, Catwalks, Walk Overs, and Ladders for personnel walk ways, equipment supports, and maintenance access. 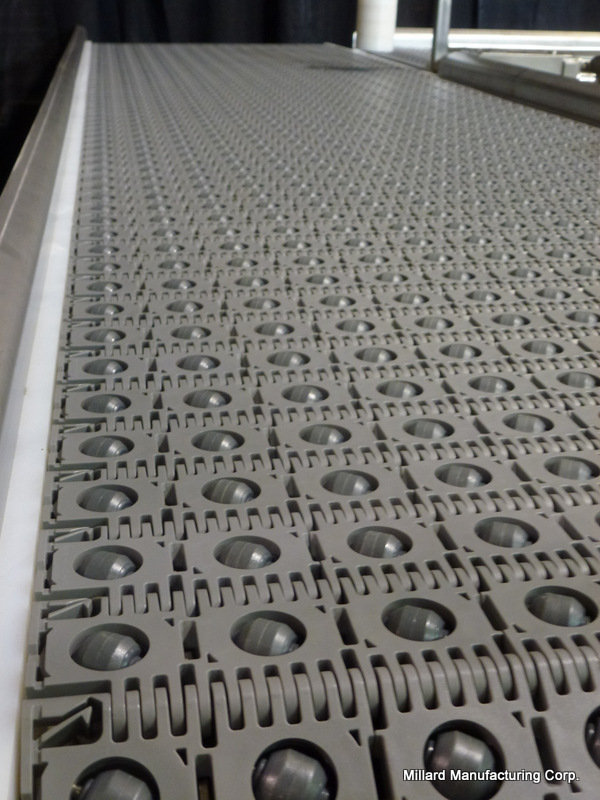 We offer a wide range of walk surfaces including our exclusive OptiGrip® walk surface. 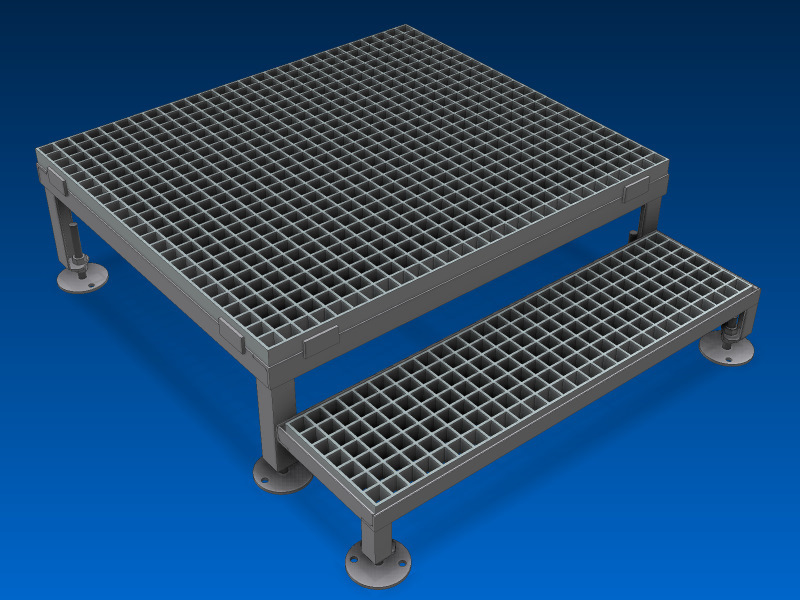 Our platforms can be general duty or engineer certified to support your application and need. 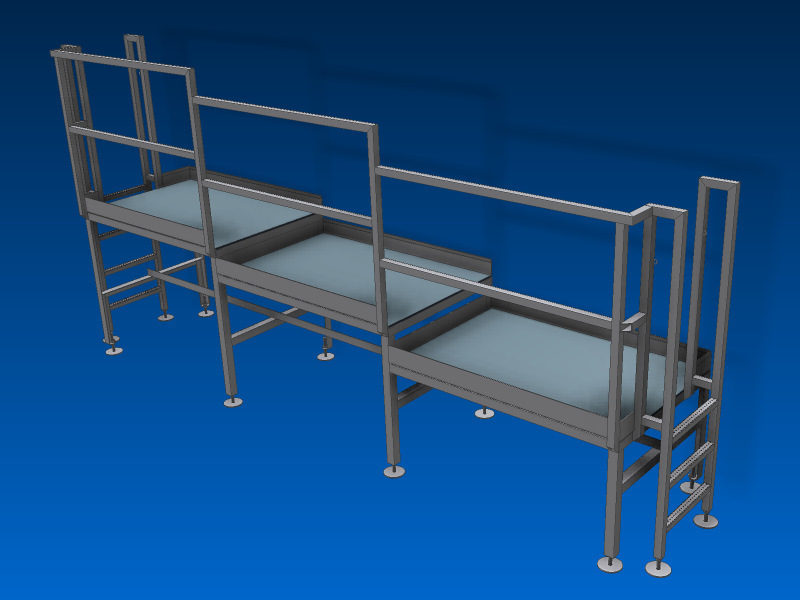 We provide safety features and railings per your application. 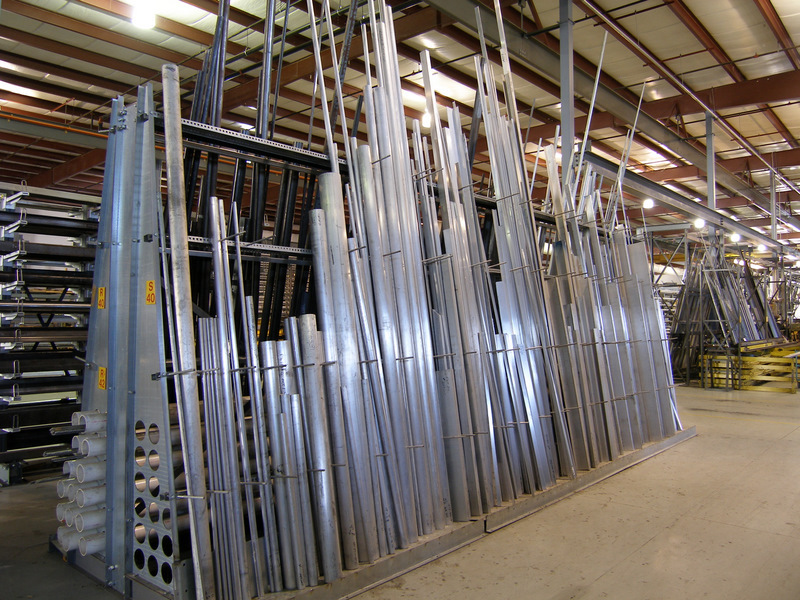 Millard Metal Services (MMS) is an affiliate of Millard Manufacturing Corp. and is a supplier of Stainless Steel, Aluminum, Carbon Steel, Galvanized Steel, Brass, Bronze, and Copper Alloys. 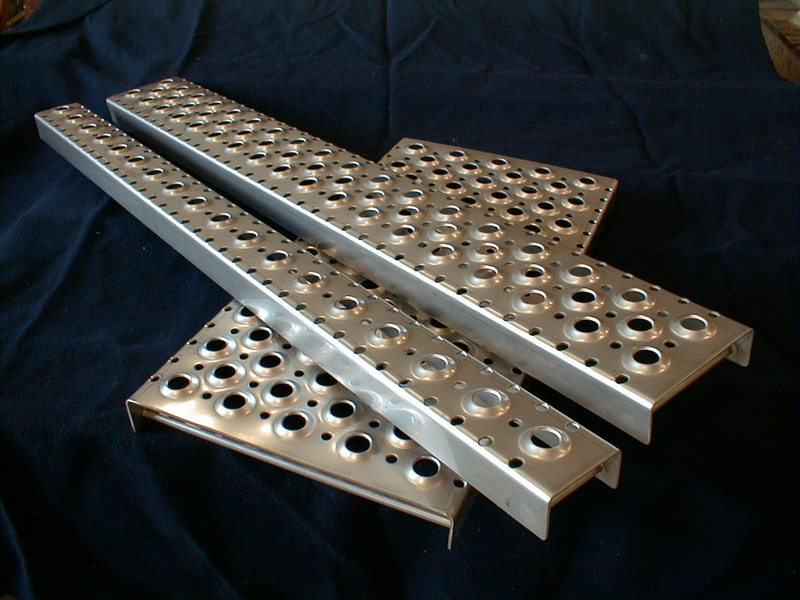 Raw material is available in custom "cut-to-size" and standard stock sizes such as: Plate, Sheet, Bar, Angle, Pipe, Beams, Structural, Square & Round Tubing, Channel, Flat, Rounds, Half Round, Squares, Hexagon, Tee, Perforated, Threaded Rod, Expanded Metal, Grating, Threaded Rod, Metric, Textured and Custom ordered stock. 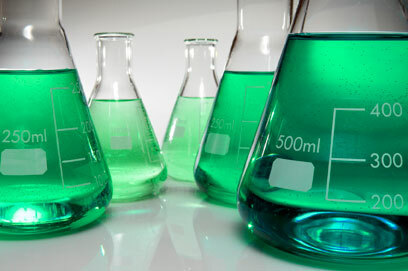 Having MMS as an affiliate provides us with a unique advantage to start your project quickly. 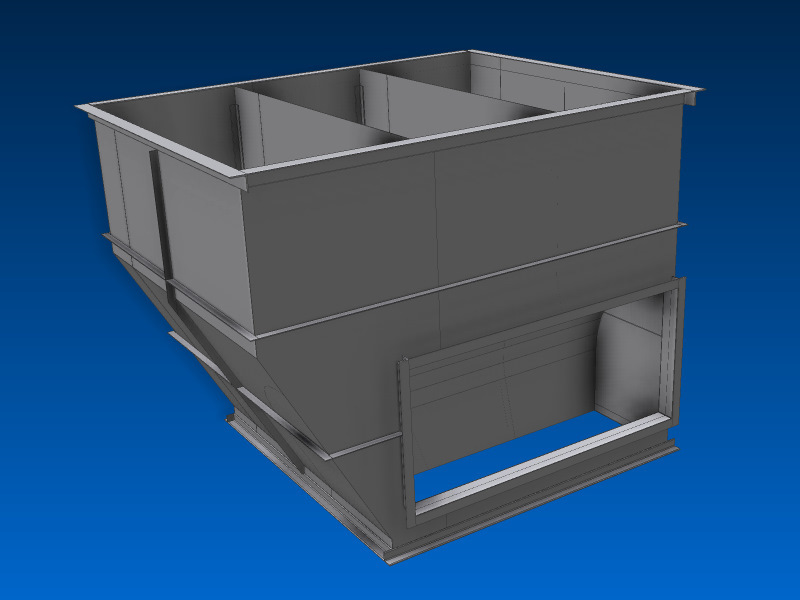 Single piece to truck load orders accepted. 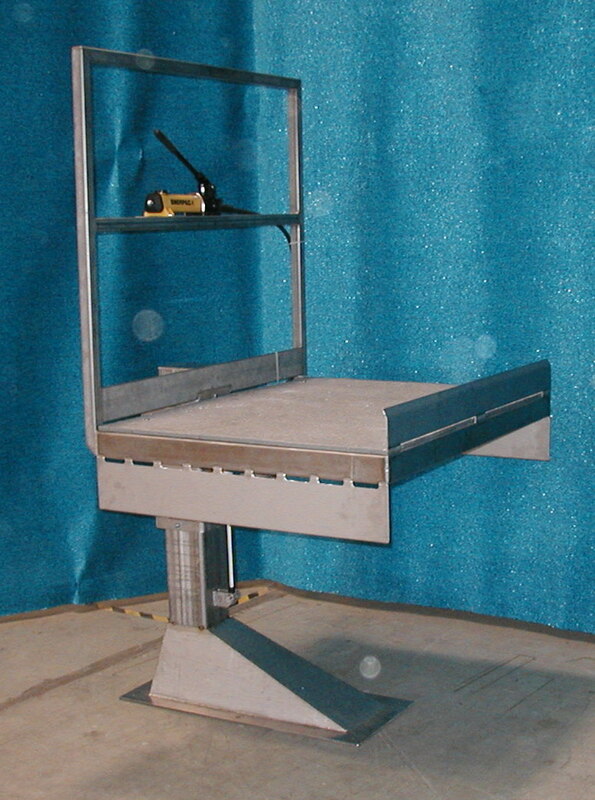 Most items are available in stock. 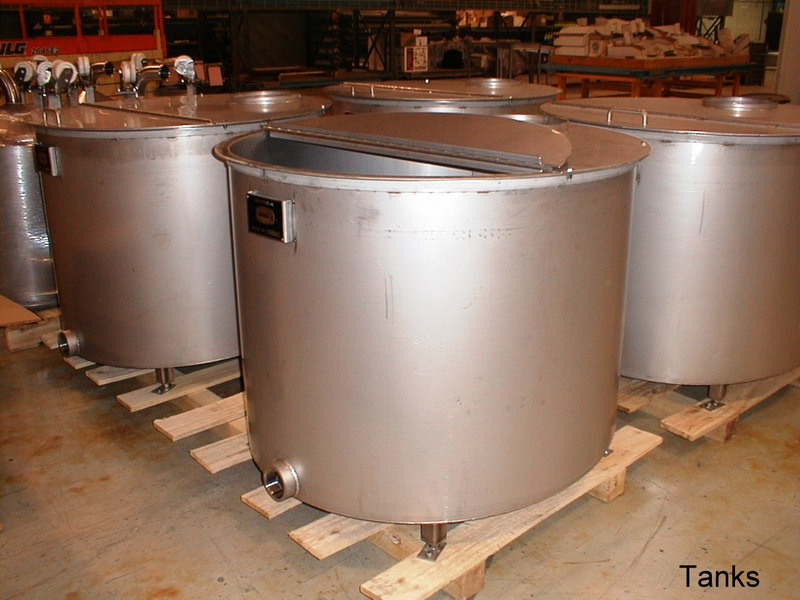 Millard is experienced in building Tanks (Non-Pressure Vessels) of all sizes and shapes for the food processing industry. 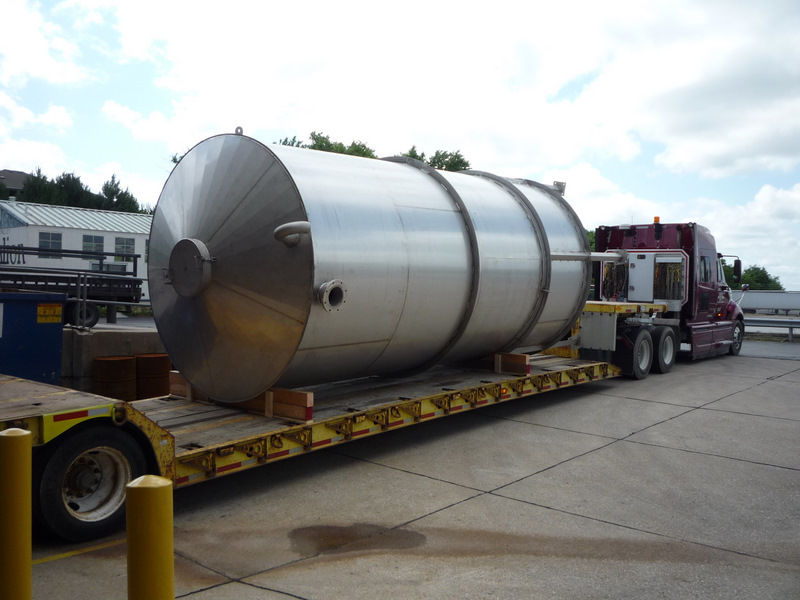 From just a few gallons to a 10,000 gallon liquid tank, we can fill your tank needs. 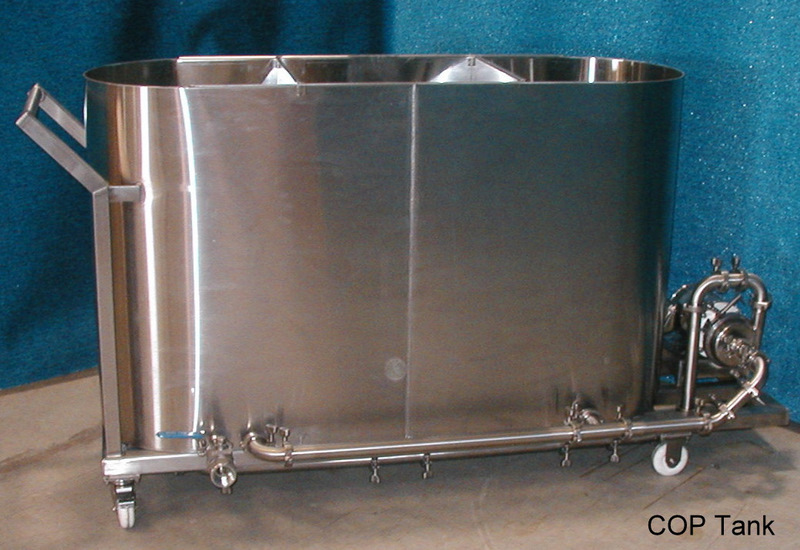 Heavy duty stainless steel is used on most applications but carbon steel is available for non-sanitary applications. 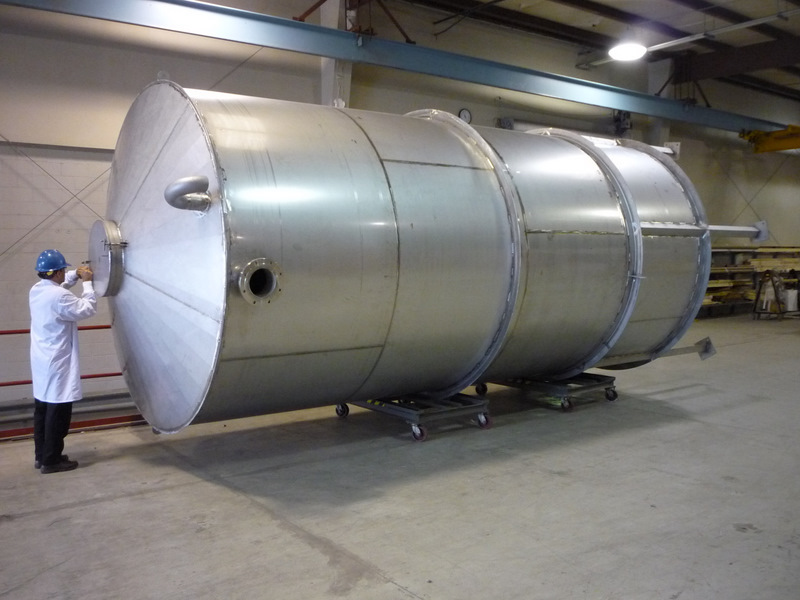 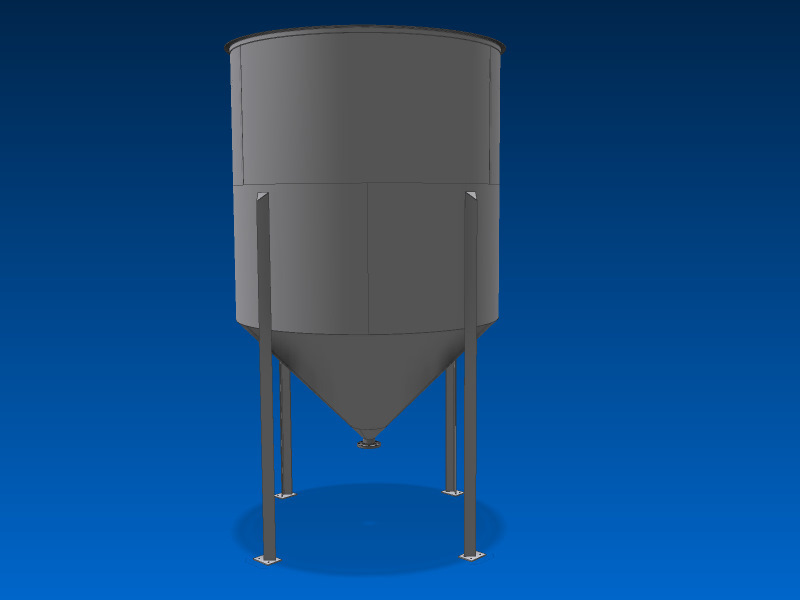 We can engineer your tanks complete with inlet and outlet fittings, inspection ports, supports, and lifting eyes if needed. 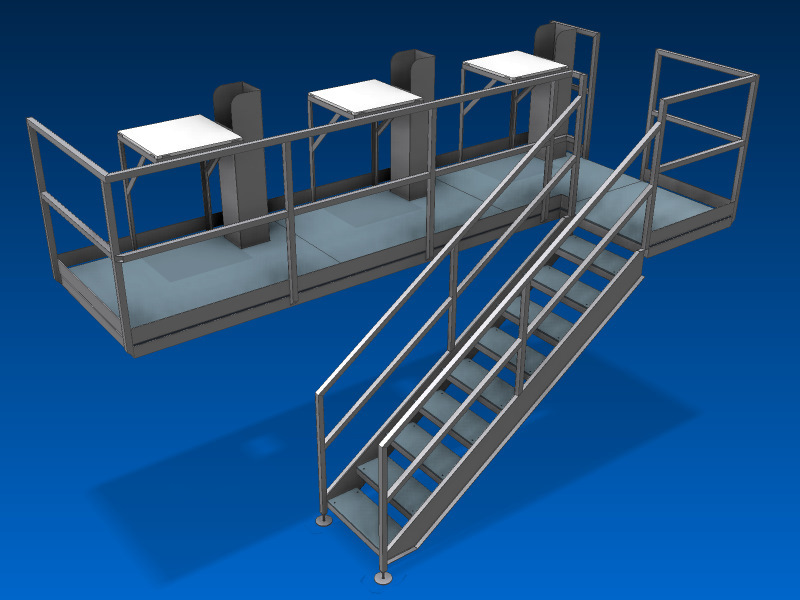 No matter what the industry, Millard can provide you with safe and sanitary personnel work stations or ergo stands at either floor level or elevated to bring you to the work. 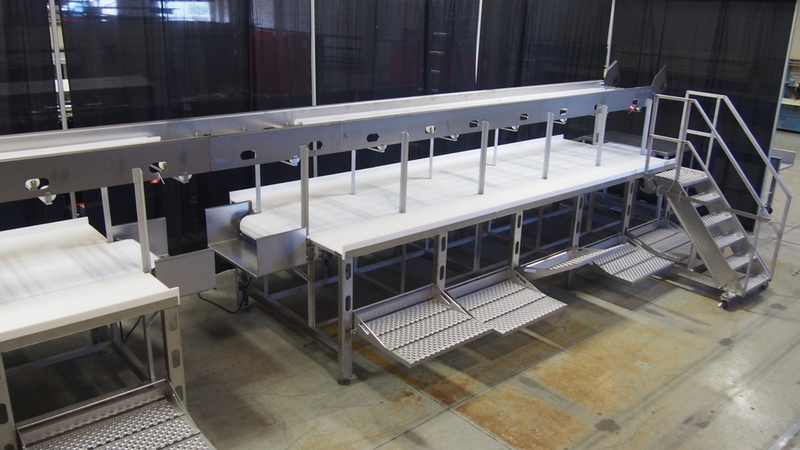 We will work with you to custom design, build, and install the proper work stations and ergo stands to fit your processing applications.